All Balboa Weekend celebrated its 15th Anniversary this year and I celebrated my 9th anniversary of attending ABW. This Balboa homecoming/family reunion is one that I look forward to every year for the friends, the amazing dancing, and the wonderful vintage shopping that is available in Cleveland. This year, my report will combine shopping inside and outside the hotel, since some brick and mortar stores set up booths at ABW and other remain in their brick edifices. 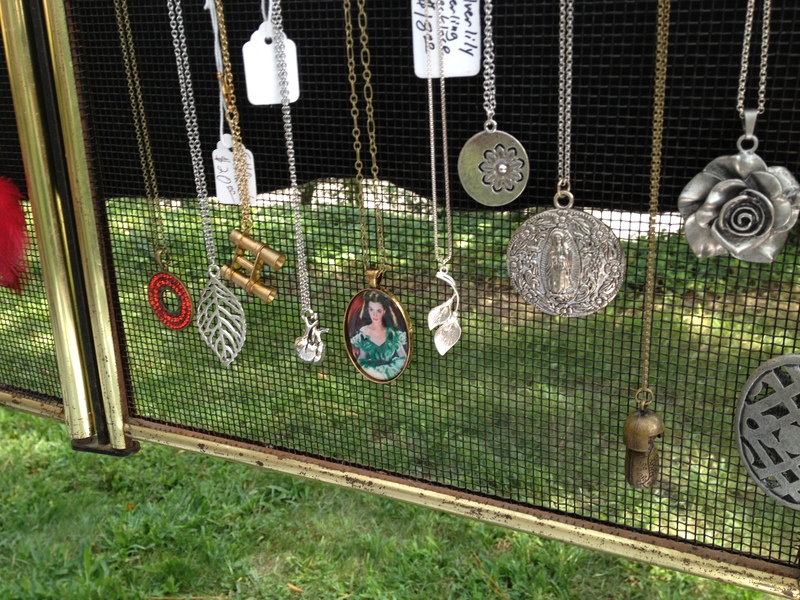 All are worthy of mention and this year’s shops and vendors did not disappoint! My partner in crime this year was Berkeley, California dancer Alisa Szatrowski – I’ll give an honorable mention to Jack Flaps, a wonderful brunchy place she discovered and where we fortified ourselves before a day of vintage shopping. 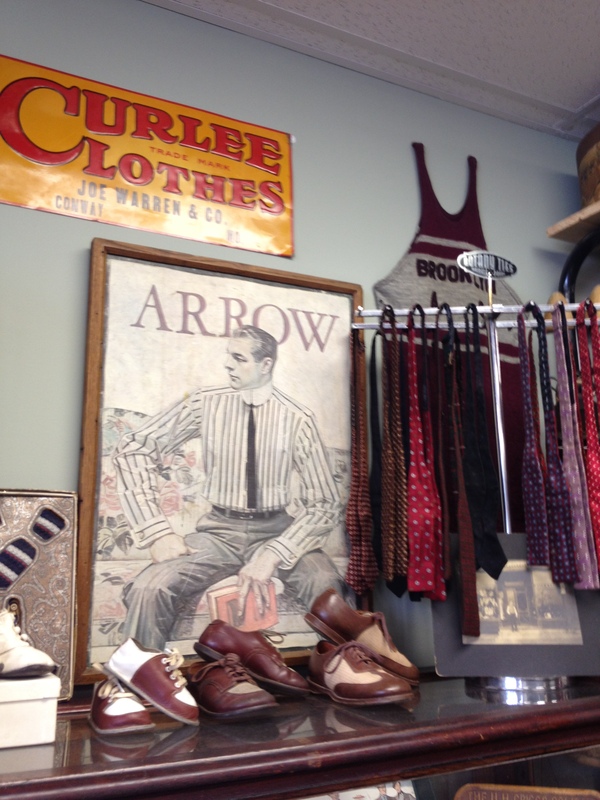 Our first stop is my always first stop, Sweet Lorain, and the owner Redwin Lewis welcomed us with open arms and escorted us back to the 30’s and 40’s area, where he showed us they had pulled additional racks of 30’s and 40’s clothing out just for ABW. *squee! 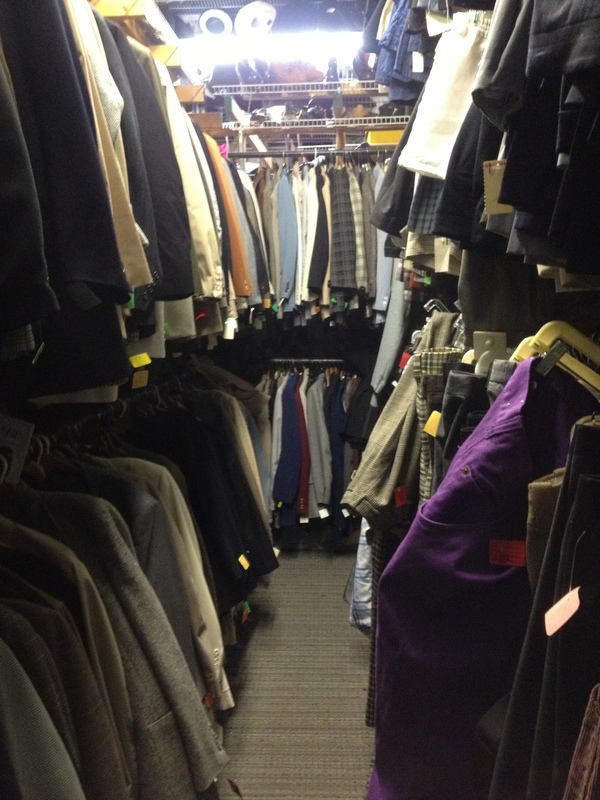 * Soon, Alisa and I were lost in a jungle of clothing, amongst the close and very full racks, calling out to each other as if we were playing Marco Polo to try to find each other to show off choice garments. Sweet Lorain did not disappoint and Alisa and I soon had a dressing room full of things to try on, with another helpful employee pulling additional garments based on our selections. Seriously, an A+ for customer service. We both left with some wonderful pieces and warm fuzzy feelings about everything at Sweet Lorain. Next stop was Chelsea’s Vintage Clothing and Costumes, which is an impressive warehouse full of clothing, and particularly has a large selection of menswear, which I wrote about more in-depth last year. We ran into dancer and DJ Bill Speidel and we did a quick run through the menswear, as I’m always shopping for certain dudes and the hubs. 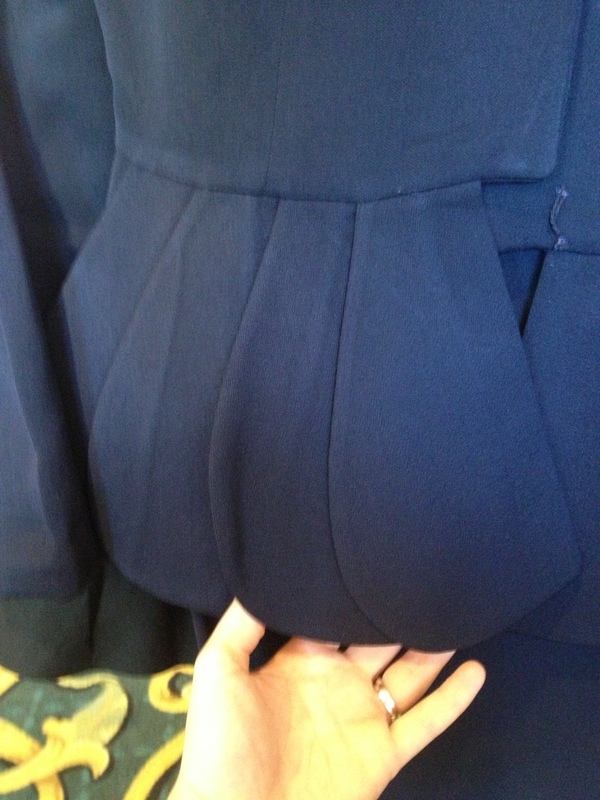 I left Chelsea’s empty-handed, but Alisa had great luck with late 30’s/early 40’s dresses in velvet and faille – dreamy! 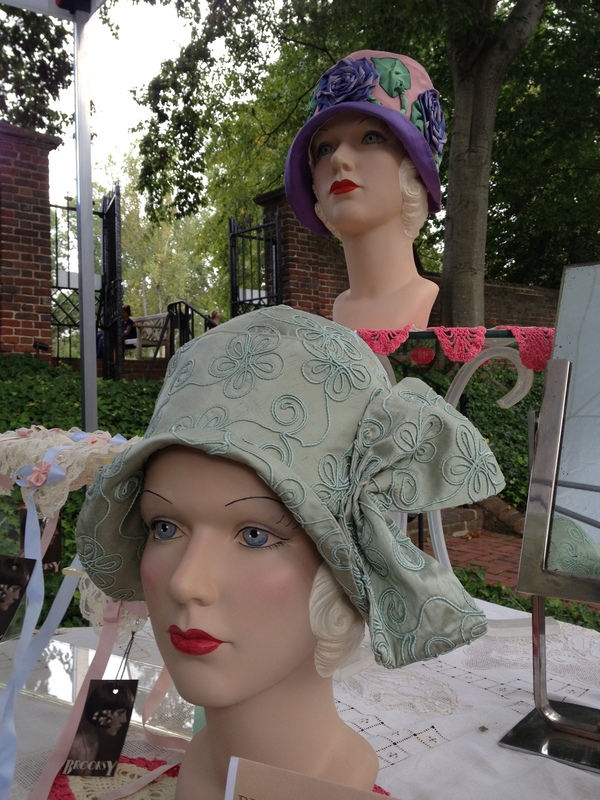 The vendor market at ABW opens at 5:00 p.m. on Thursday and we were there even a little before that, with anxious vintage lovers already hovering over the booths. The first booth you come to is Re-Mix Vintage Shoes and this booth was abuzz all weekend, with ladies buying shoes, trying on many more, and ogling the beautiful wares. 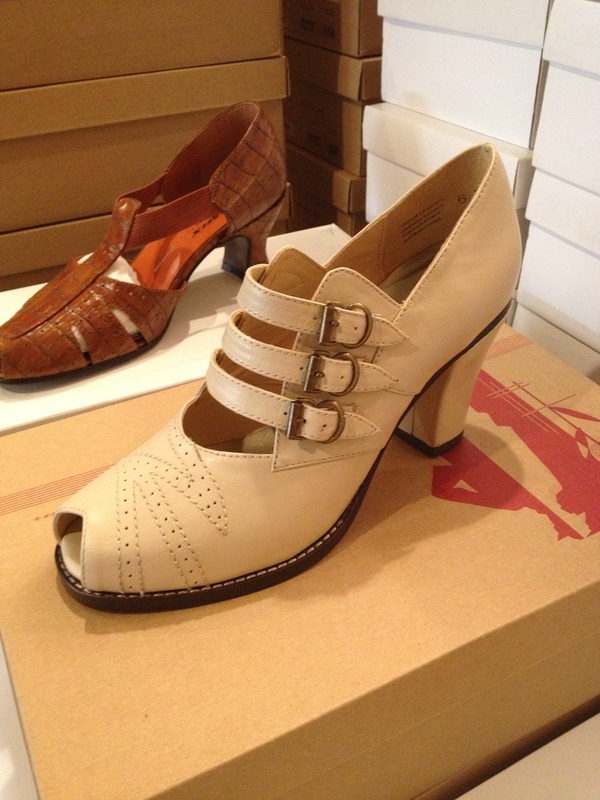 The big hit this year was a new style, Gabriele, which is a low heeled 1930’s shoe with a t-strap, an alternative to the Balboa Style, with a slightly different shape and different colors. 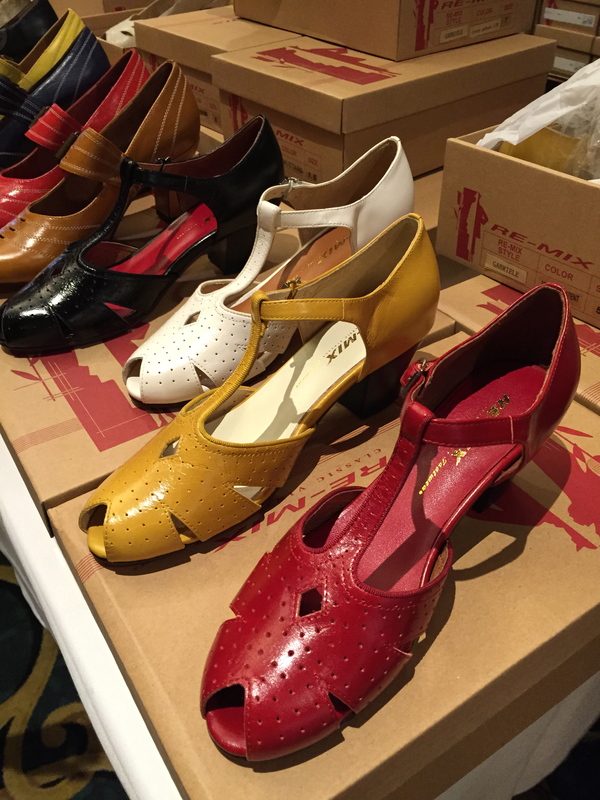 I would love to hear some reviews from the ladies who bought them and wore them this weekend – I did see Valerie Salstrom try them on the first day and then didn’t take them off as she continued to set up for the event! Next in the line of vendors was Flower Child, which is comprised of several individual vendors that make up part of the brick and mortar store, and which takes up most of the hallway. 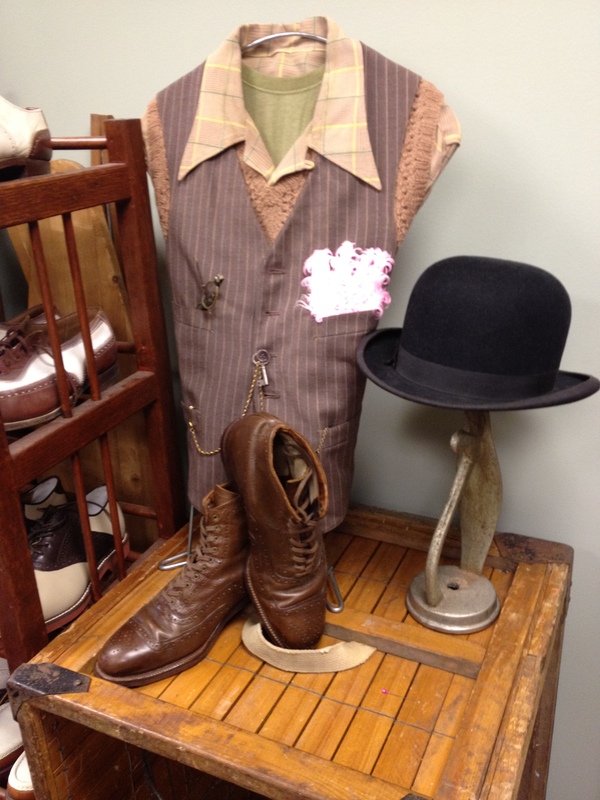 They are always good about bringing in new inventory every day, taking requests, and having a nice selection of clothing, accessories, and some novelty items and knickknacks from the swing era. 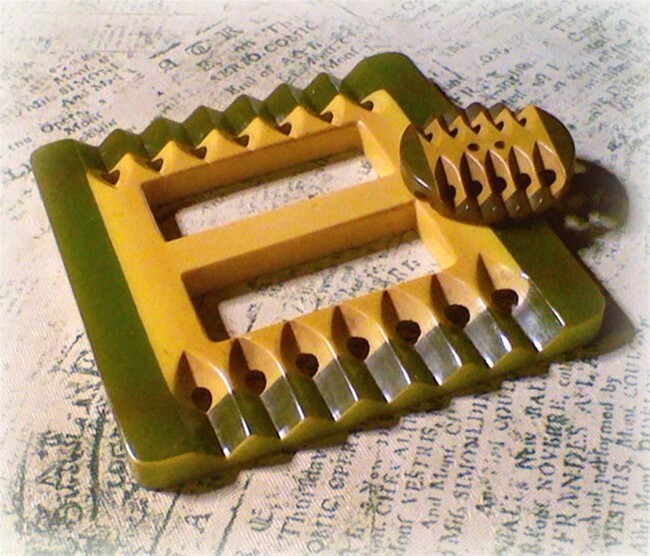 My favorite ABW find for this year came from Flower Child’s booth, a fully functional scales brooch, perfect for me as both a Libra and a lawyer – for serious, the scales have tiny chains and you could actually put things in the bowls and the scales would tip, SO COOL. 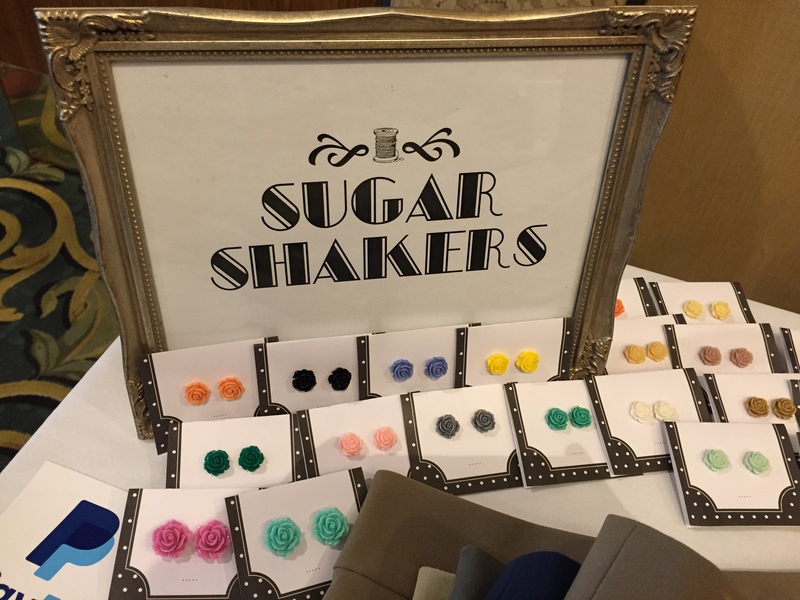 New to the vendor list this year was Sugar Shakers, the handiwork of Joanna Kassoulides Thibault, who got her start stitching chorus girl costumes for a troupe of the same name in Toronto and decided, after accumulating a wardrobe of costumes, that she would sell some of these versatile pieces. I love a good trumpet skirt and Joanna had a nice sampler of trumpet skirts, polka dot wrap blouses, bakelite-inspired earrings, as well as sharing a table with her husband Mike Thibault‘s handmade earrings and Vintage Jazz Art prints. 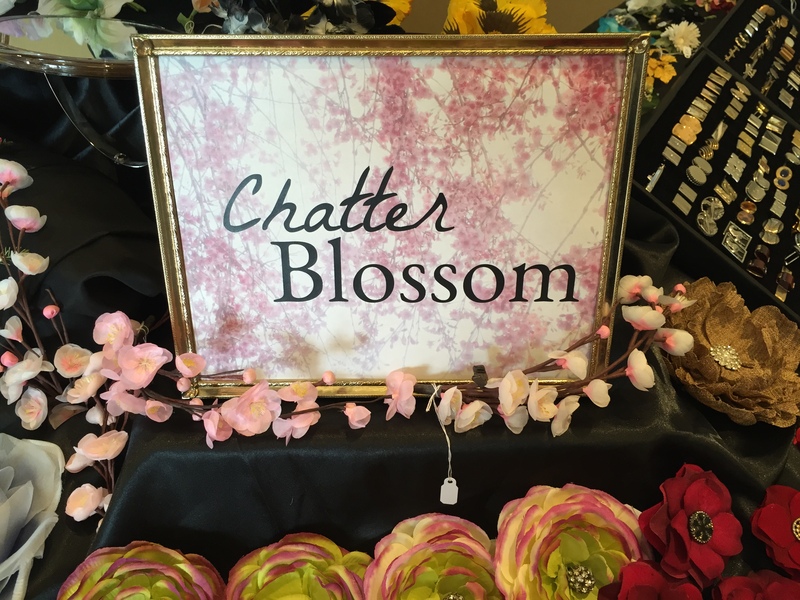 Next in the vendor lineup is ChatterBlossom, aka Jamie Sturdevant, who is local to me, but for ABW everyone can see her amazing handiwork up close, with flowers and headpieces made from vintage millinery flowers and jewelry made from vintage buttons. Seeing in person is even better, as I noted people running to their rooms for garments, trying to match a bloom to a dress, and (I know I’m a broken record on this, but) the colors in the vintage flowers are just so right for vintage clothing, for obvious reasons, and they are so much more exquisitely detailed than most modern artificial flowers I have seen. 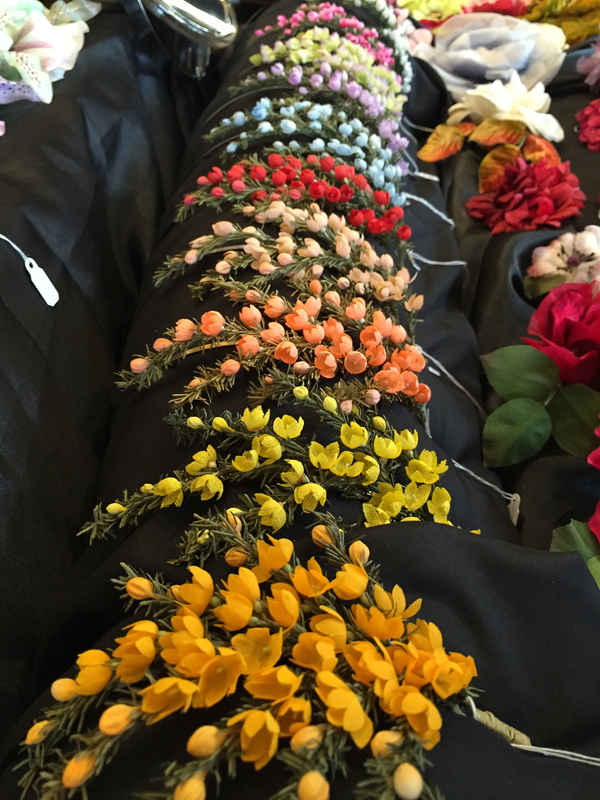 Jamie does custom pieces, too, so you can find the perfect bloom for that one of a kind vintage dress. Holding down the end of the hallway was The Cleveland Shop, which had a nice selection of men’s and women’s clothing, accessories, and jewelry. 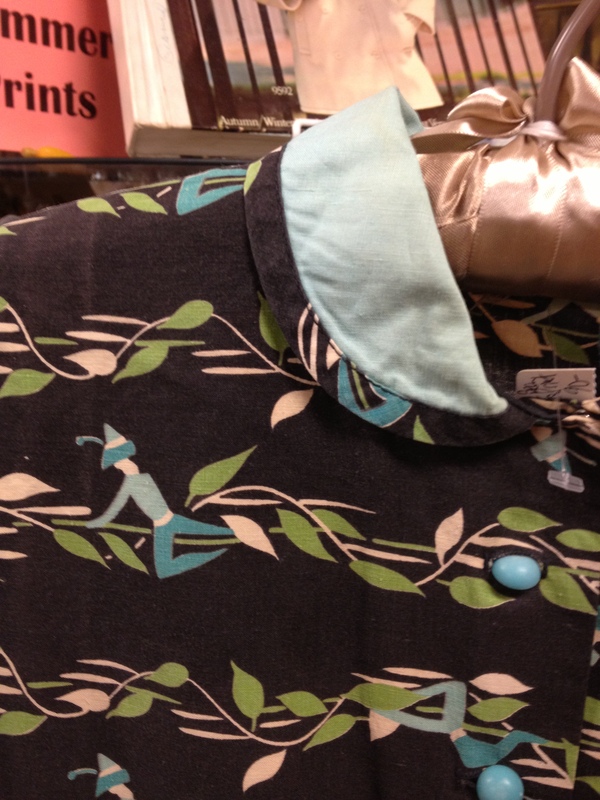 The owner would also bring in new items daily, and even brought in some divine tropical rayon fabric one day, that was gone before it could hit the market (I can’t wait to see that blouse, Jamie!). 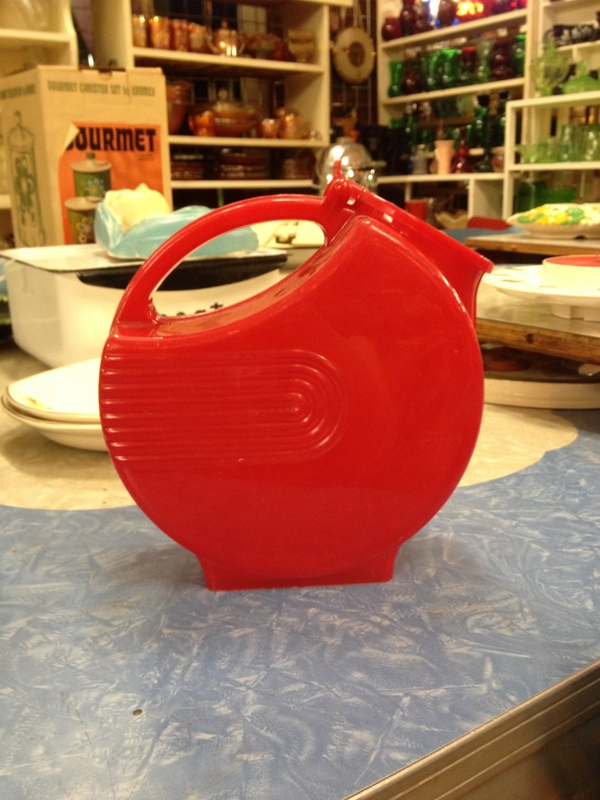 Oh, to have a warehouse full of endless vintage things to sell! 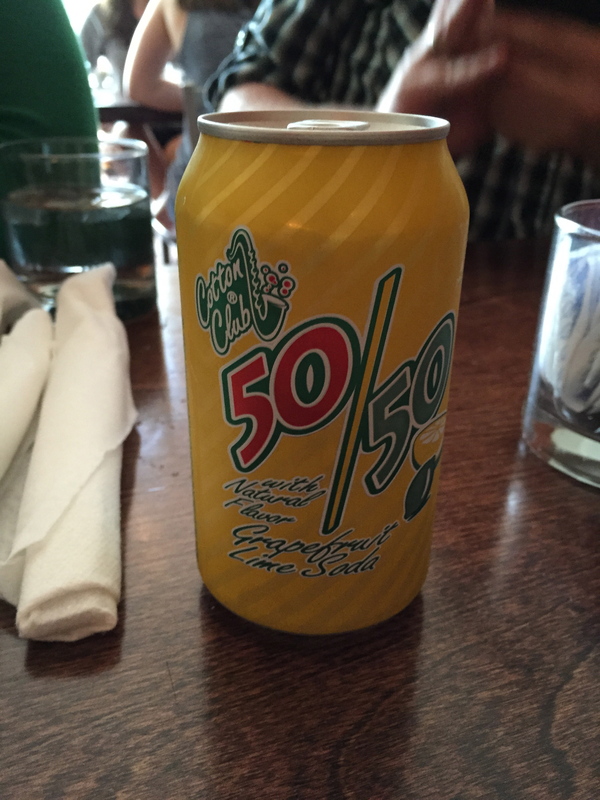 Who knew the Cotton Club had a soda? At Jack Flaps. 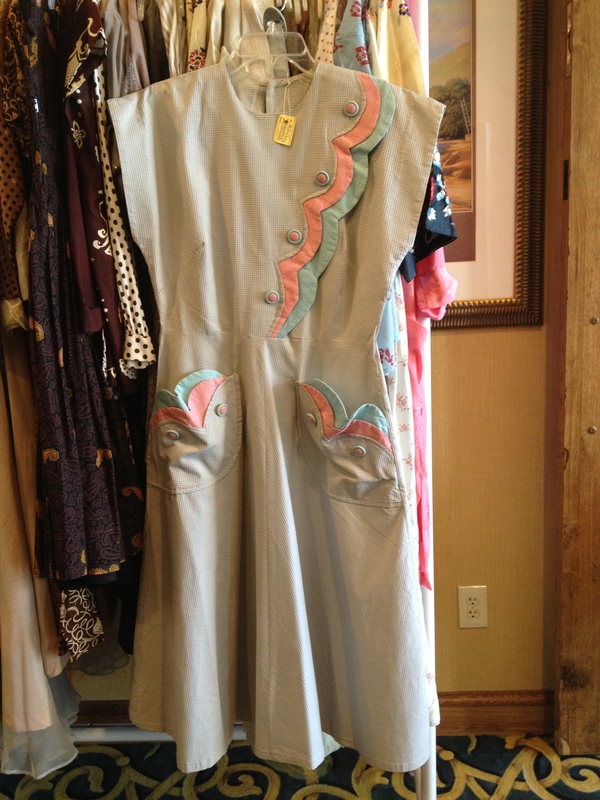 1940’s jumper with fringe and embroidered pockets at Sweet Lorain. 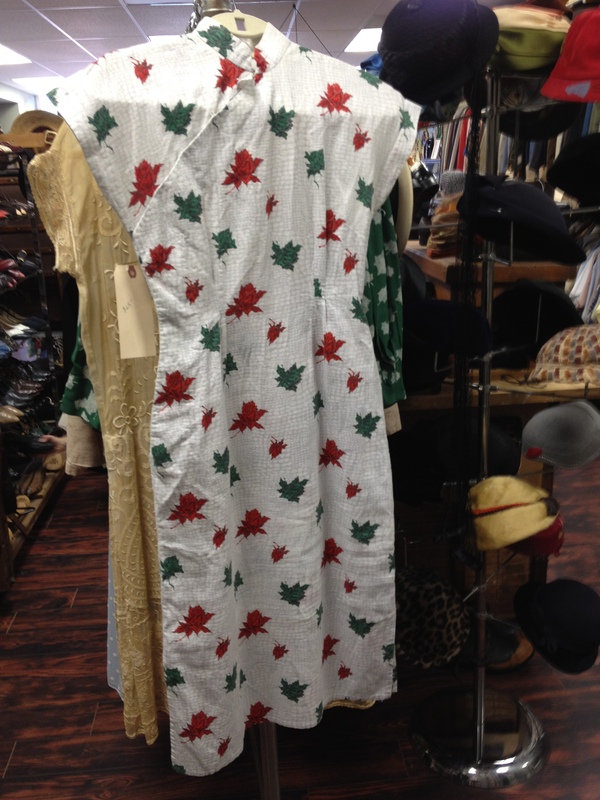 1940’s rayon dress at Sweet Lorain. 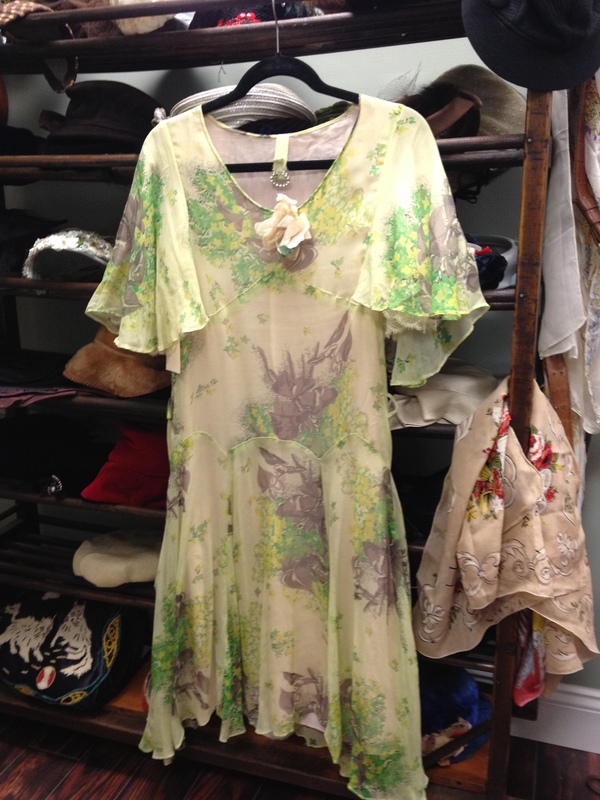 Gorgeous 1930’s dress from Flower Child. 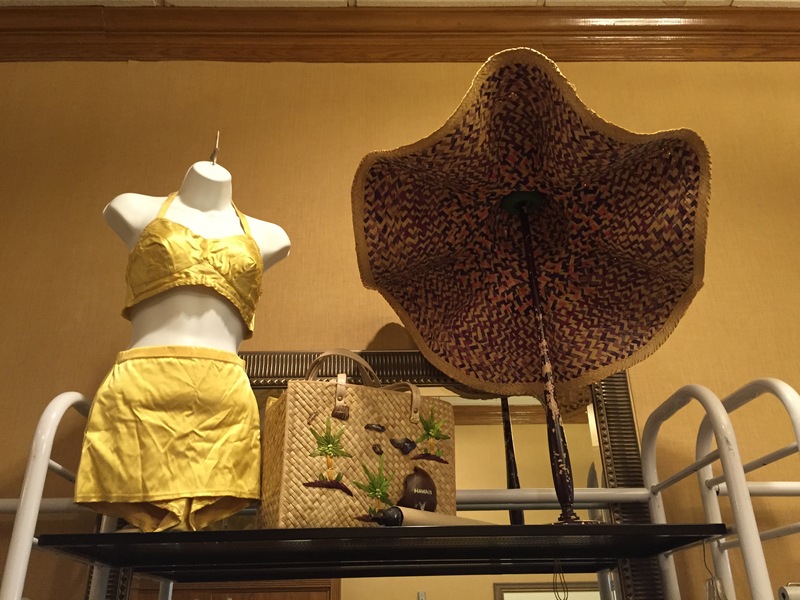 Gold bathing suit and the biggest sun hat I’ve ever seen, at Flower Child. 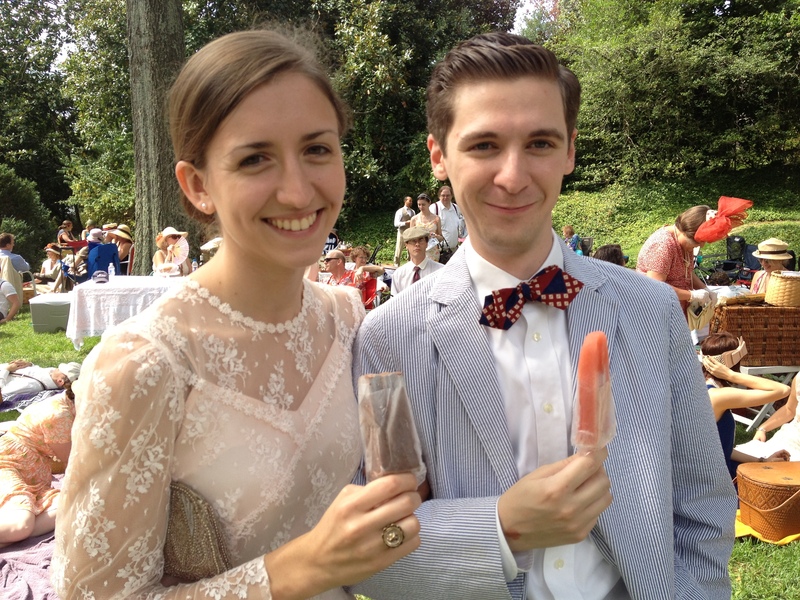 A few weeks ago I attended the third annual Art Deco Society of Virginia Gatsby Afternoon Picnic in Richmond, Virginia. I have seen this event grow from “let’s all meet in a park at the same time” to an organized event at the historic Wilton House Museum, with live music, vintage vendors, an on-site barber, food trucks, photo booth, contests, media coverage, shuttles, parking attendants, an MC, and even an alcohol sponsor. 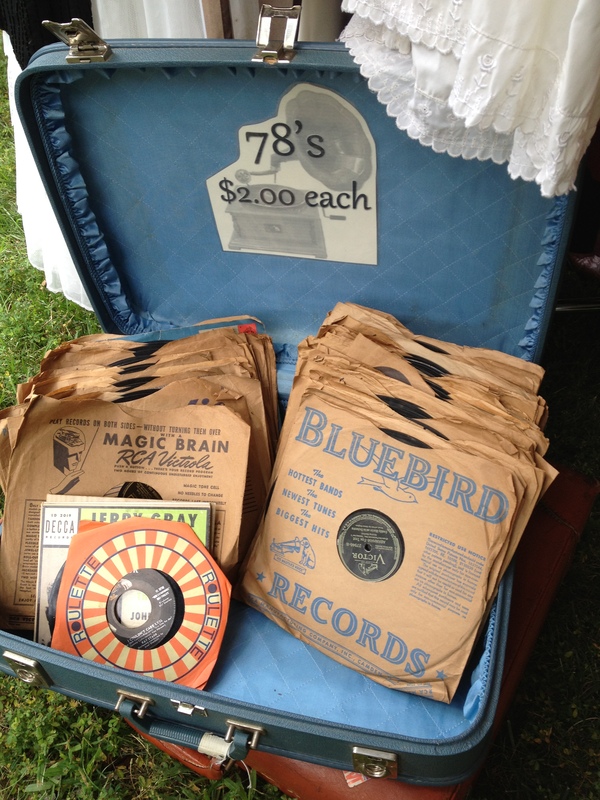 I was happy to see some familiar faces amongst the vendors and pleasantly surprised to find vintage vendors that were new to me. 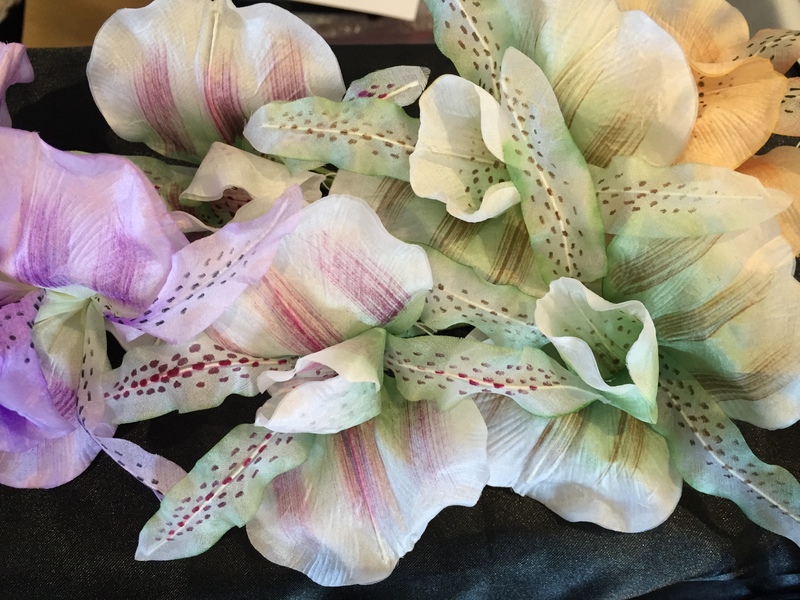 Let’s start on one end of the line and move to the other – first in the lineup was Chatterblossom, who has become my own personal vintage millinery Philip Treacy. 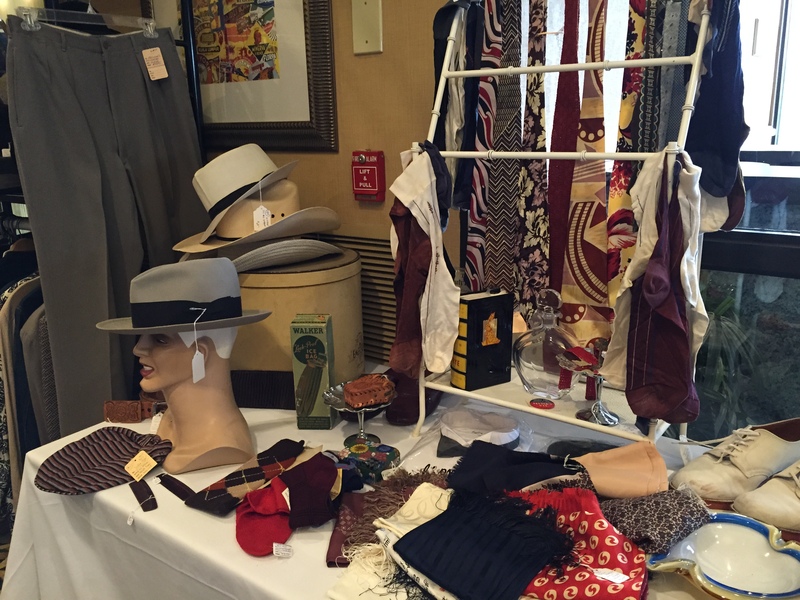 The gorgeous millinery was on display, as well as lovely jewels, flapper headbands, and a nice selection of menswear accessories. If only women’s dress shirts didn’t button from the opposite side, a tie clip with vintage microphone would have certainly left with me! 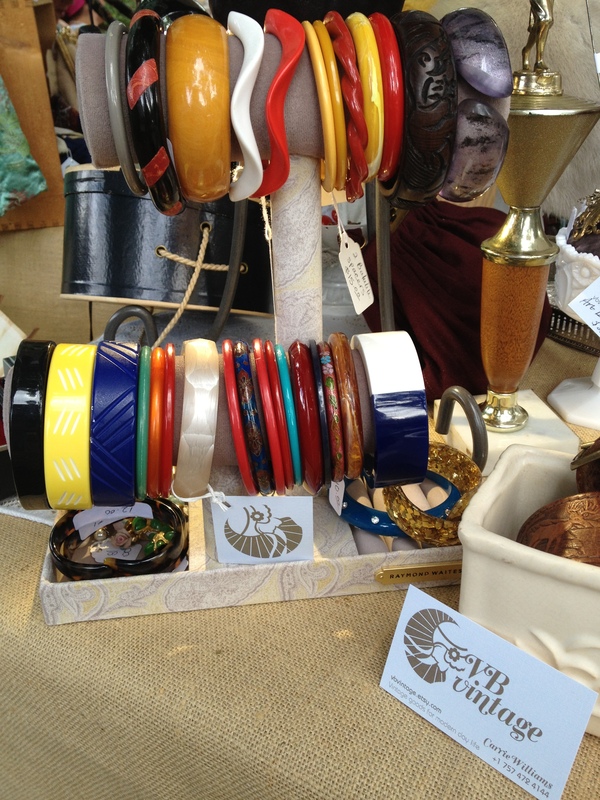 Another standby for me, Raleigh Vintage, was present with a drool-worthy display of Art Deco era goods and jewels. This display was on the heels of another festival in Raleigh the previous day, but the busy bees at Raleigh Vintage persevered and were present in force. I am seriously in love with all of the jewelry in their display, can I just take the silver tray full of necklaces home with me? 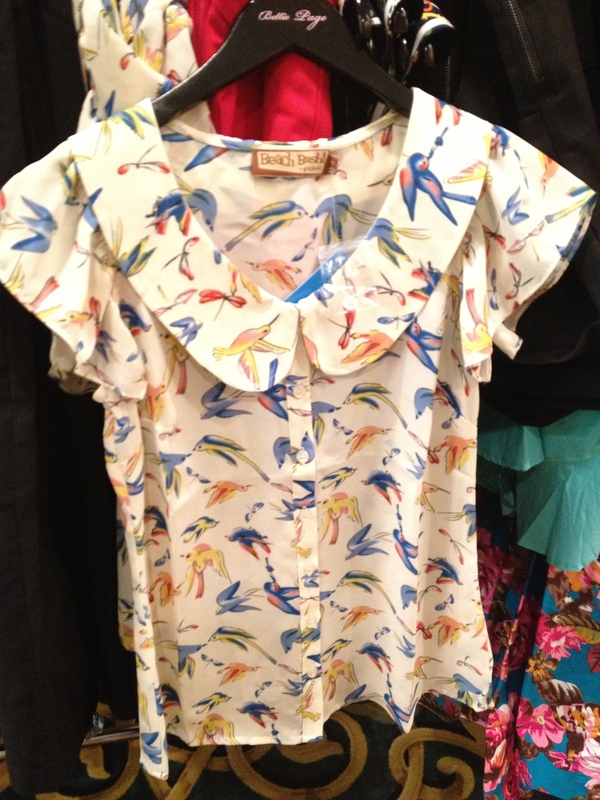 Also, lots of event-appropriate cotton frocks in lovely prints, embroidery, and all things just-so. Machine Dance Vintage and Brooksy shared a lovely space together, complimenting a rack of MDV vintage dresses and goods with Brooksy’s hand-crafted 1920’s hats and headbands. 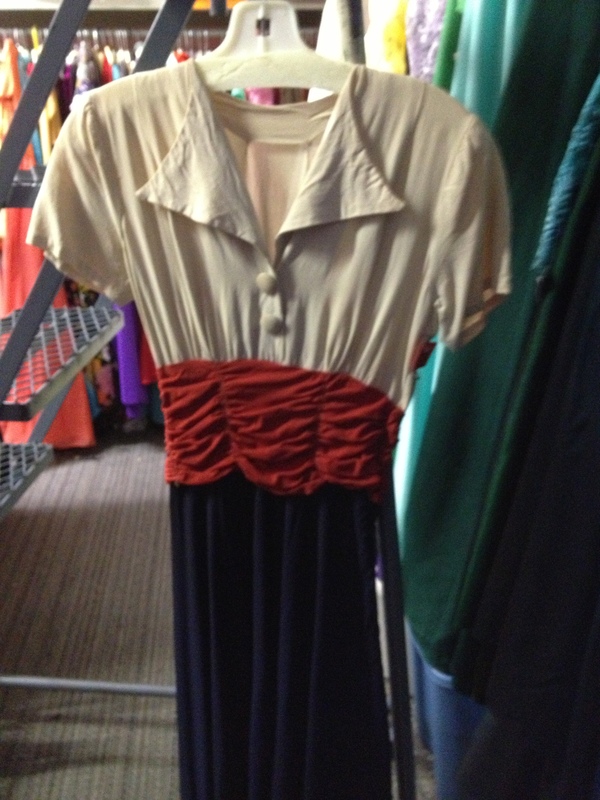 I have long been a fan of MDV’s Etsy shop and it was good to see some of these great vintage pieces in person. 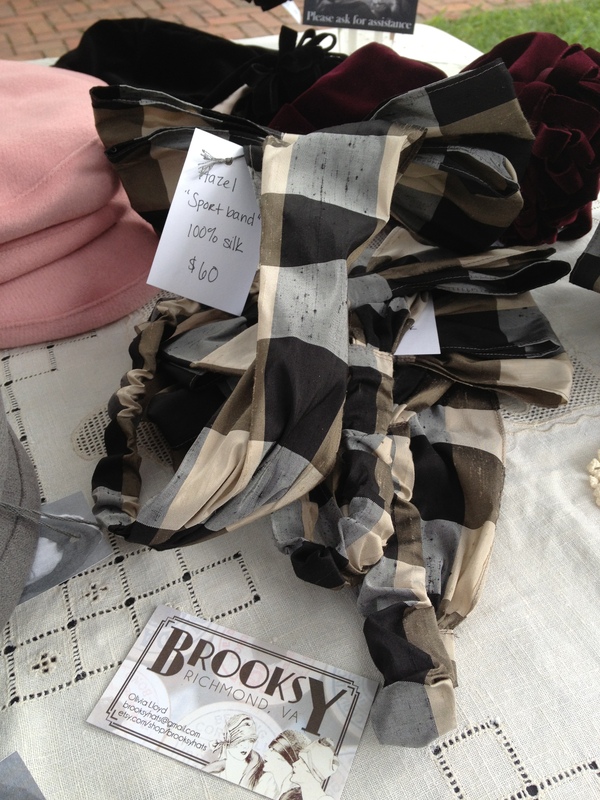 I have also been following and eagerly anticipating the soon-to-be-launched Brooksy line of hats, created by ADSVA president Olivia Lloyd. 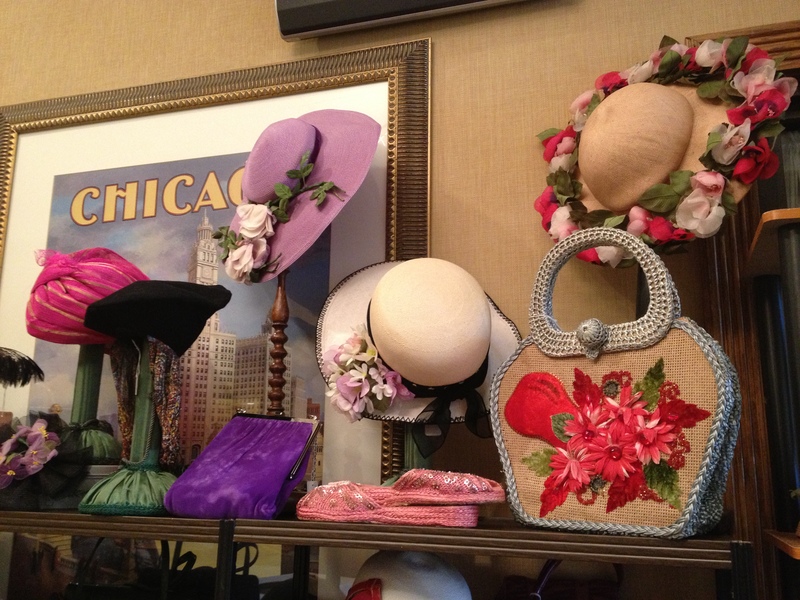 The construction of these hats and the attention to detail is as impeccable as Ms. Lloyd’s vintage wardrobe. 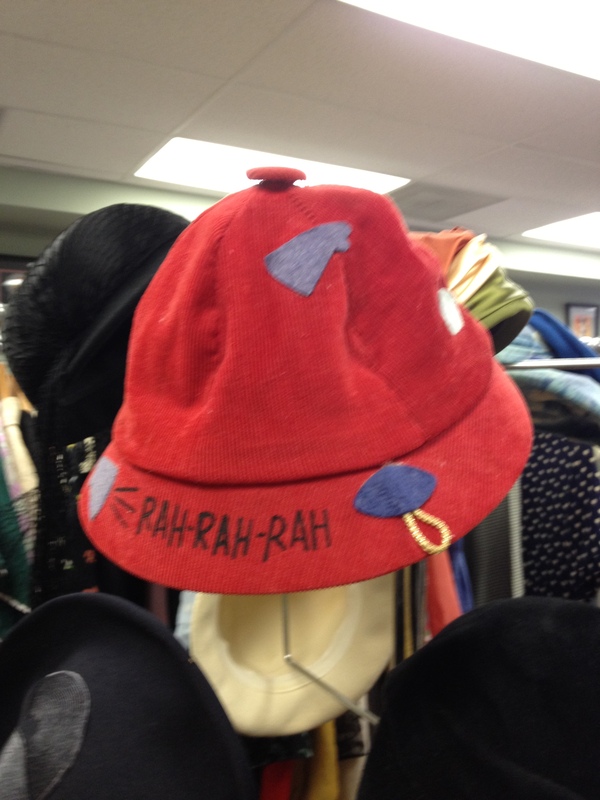 I am holding out for Myrna Loy’s pixie hat! 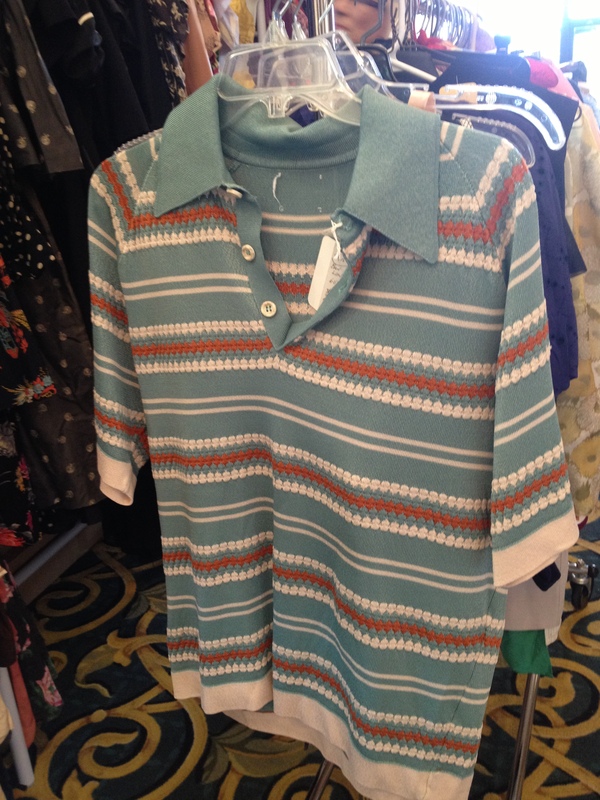 My husband’s family lives in Virginia Beach, which has many great thrift stores, but I was unaware of VB Vintage – no brick and mortar shop, but certainly an impressive enough of a display that I was kicking myself for not knowing about them before now. 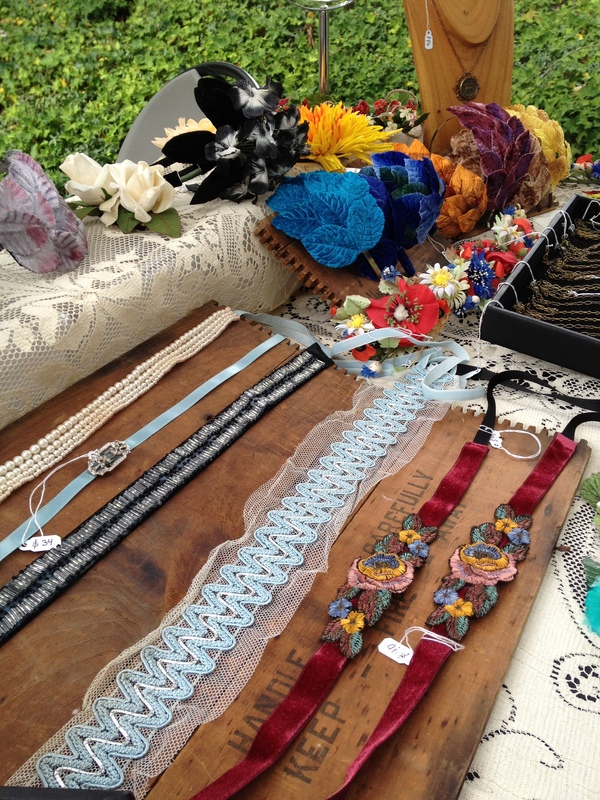 Their Etsy shop doesn’t even come close to displaying the number of goods they had on hand at the Gatsby picnic, which means there’s even more to come – also, the benefit of being on location for these trunk shows! 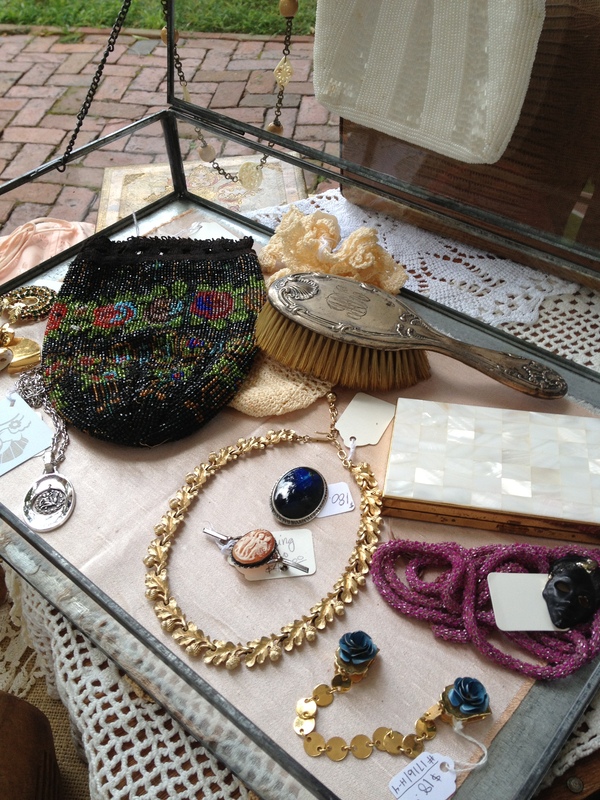 Lots of great accessories, knick knacks, and a few stellar pieces of clothing from the era. 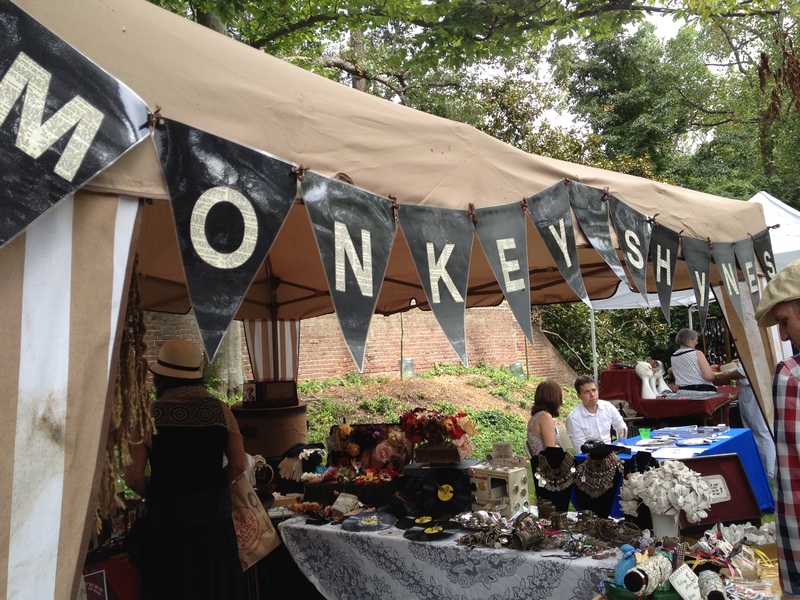 Monkey Shynes was up next, with a small selection of 78 rpm records and assorted vintage memorabilia and crafts. 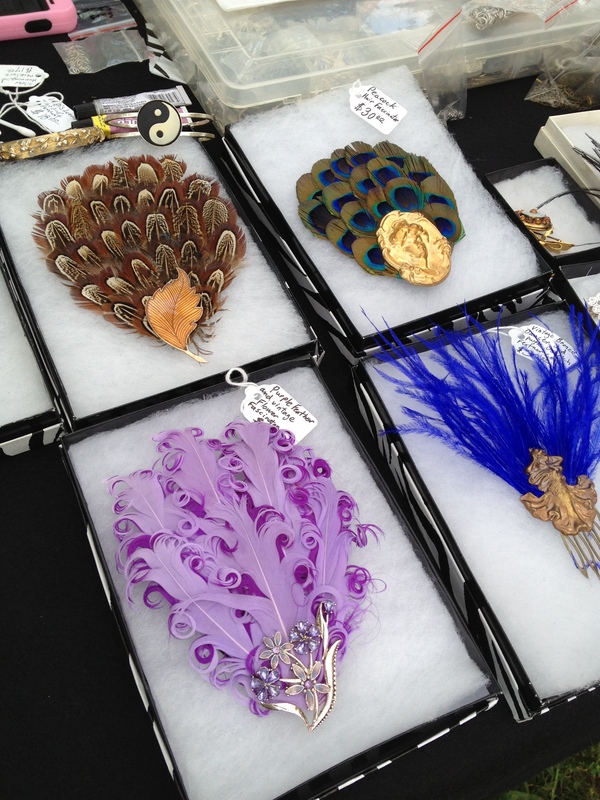 Finally, on the other end of vendor’s row was MA’s Mad House of Adornment, another Etsy vendor with great feathered headpieces and eclectic jewelry. I am particularly fond of feathered headpieces made from feathers with curled ends – the effect is really stunning and the result is that they tend to lay so nicely in whatever configuration I have seen them in. I was also amused by the Scarlett O’Hara necklace – the movie came out in 1939, so we’ll humor the reference. Check out the photos below – enjoy! I love a novelty print! 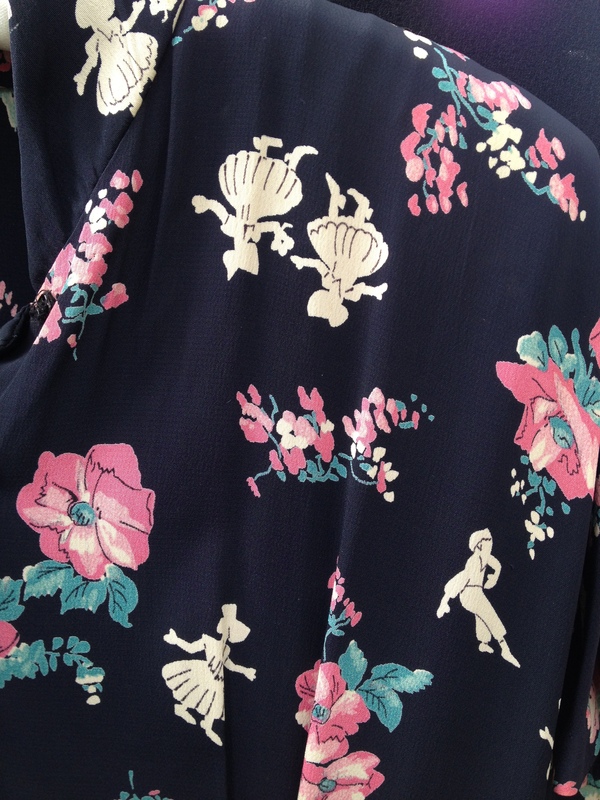 This rayon beauty is still available in the Machine Dance Vintage Etsy shop! Jewelry by MA’s Mad House of Adornment – don’t you want a Scarlett O’Hara pendant to smirk at everyone for you? 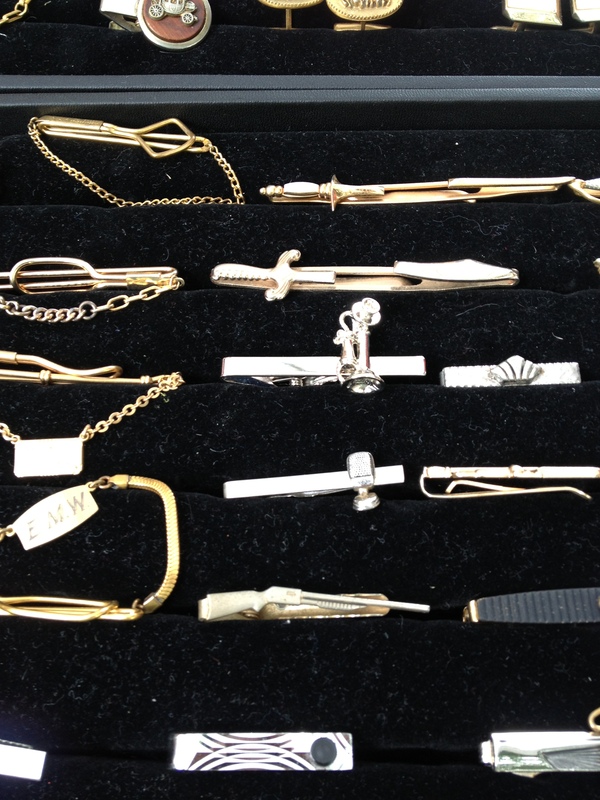 The first finds of the day at Sweet Lorain – tie clip and tie. 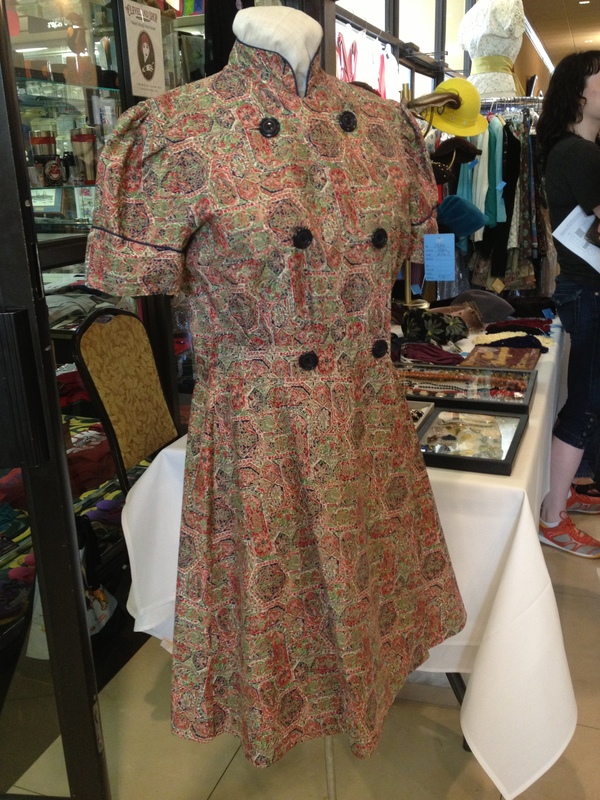 One of the reasons I enjoy All Balboa Weekend so much is the vintage shopping and vendors at the event. 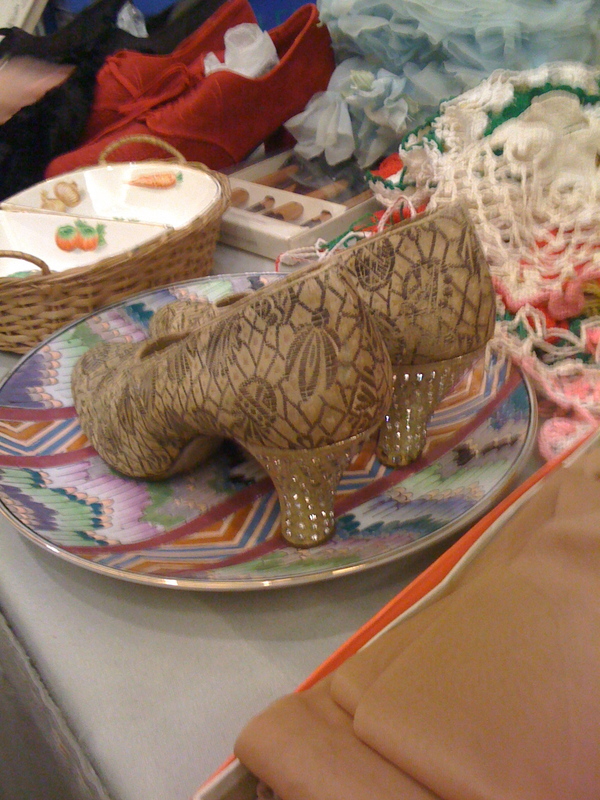 This event is like no other because Remix Vintage Shoes comes here (and doesn’t travel to other swing events), there are multiple fantastic vintage stores and some of them set up as vendors at the hotel, and there are new international vendors every year that may only come for one year, but you get that critical chance to try things on, figure out what size you wear, and file that away for future online ordering (Heyday!, Retrospec’d, Bettie Page Clothing, FromChloehong, etc.). It offers the unique opportunity to have all of these things in one place, which would otherwise only be available on the internet. When I travel I always come up on Wednesday night so I can have Thursday day to go shopping at the vintage stores in Cleveland. My travel companion this go around was Skyler Hinkel, a 20 year old dancer from Raleigh who has become a staple of our scene in the past couple of years and has recently begun traveling a lot more to dance events. I asked him if he wanted to go shopping with me and he asked me how much money he would need to budget to get an outfit and a new pair of dance shoes (good question to ask!). He told me he wanted to spend some money on clothing for dance events and, at the time, he only owned two pairs of dress pants and one dress shirt. Our mission was clear and there was no time to waste – building 1 or 2 outfits of vintage/thrifted clothing is something usually done over time, not in one day. 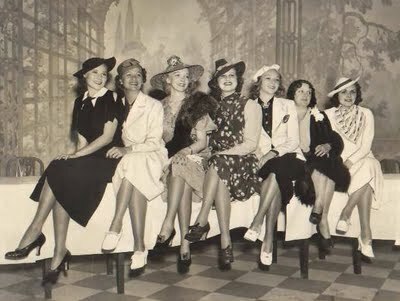 We started out at Sweet Lorain, my favorite Cleveland vintage shop, and were there when they opened at noon, along with a number of European Balboa dancers who also collect vintage clothing. 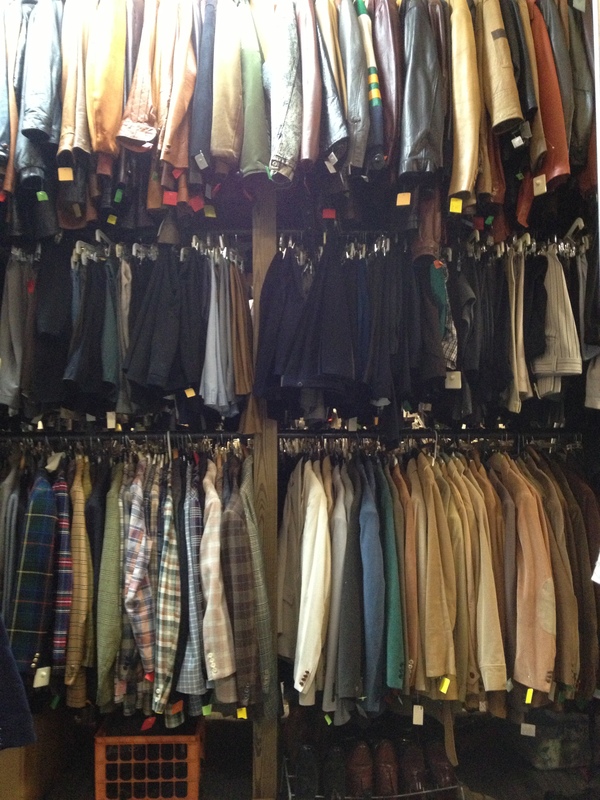 I headed to the racks in the back with the 30’s and 40’s clothing and directed Skyler to the men’s section, figuring he would either sink or swim. I made my rounds with the other ladies, tried everything on, narrowed my choices, and headed over to the men’s section to see how Skyler was doing. It can be overwhelming being in a store like Sweet Lorain, even for me, with wall to wall clothing, furniture, and knick-knacks – Skyler was definitely feeling overwhelmed. I started digging with him, with some occasional input by Andreas Olsson and Rich Werden, but ultimately everything he tried on was too large. 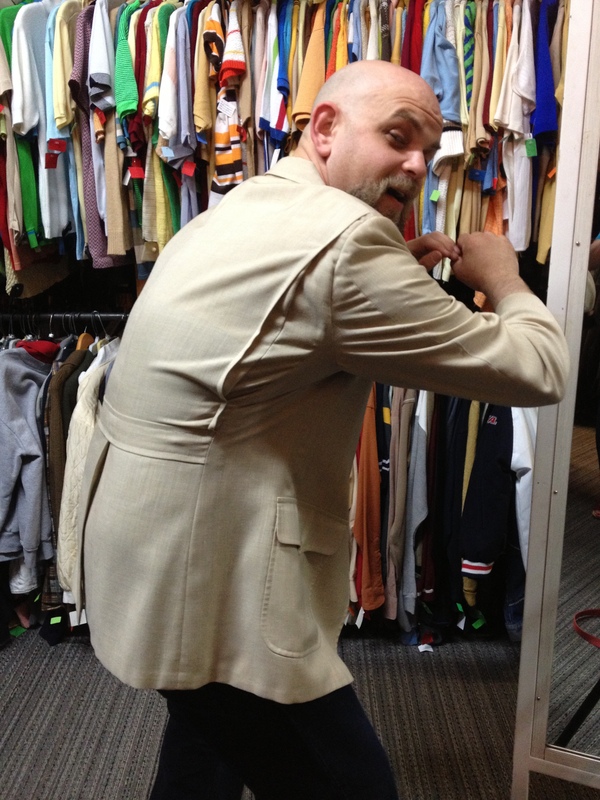 I was astounded because I thought for sure we’d find some great 34/36 jackets that no one else could fit into, but most everything was firmly in the 40/42 size range. 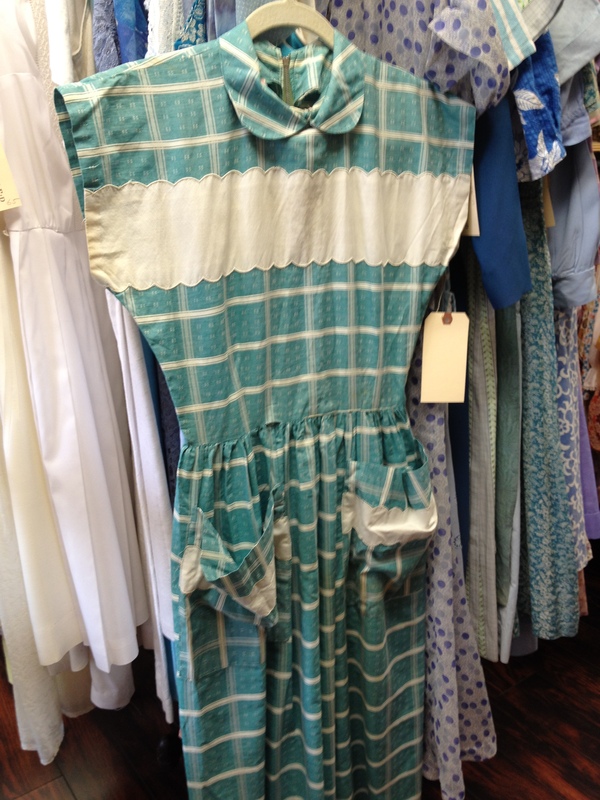 The myth that vintage clothing is only for tiny people has been disproved once again! We left the store with a tie and a tie clip for Skyler, nowhere close to an outfit, but at least able to accessorize the outfit he already owned. Our next stop was Chelsea’s Vintage Clothing and Costumes, which was a bust for me last year, but has an astounding three tiered warehouse full of clothing, almost half of it menswear. 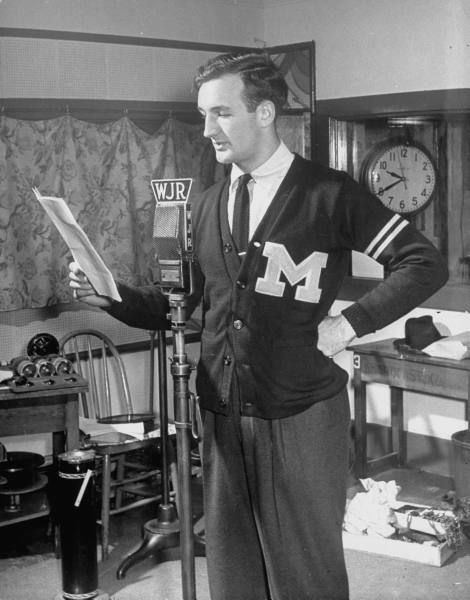 Since menswear has changed very little since the 1930’s, almost anything we could find here would be great – anything that fit, at this point, would work and if we could find natural fibers that would be a bonus. Rich joined us again for this search and, between the three of us, we touched every single suit jacket and sportcoat in that place. NO SMALL FEAT. It definitely helped that Chelsea’s had tags on each of the sleeves, noting the size and price, whereas none of the clothing was labeled by size in Sweet Lorain. Neither store had things grouped by size, so there was no choice but to dig. 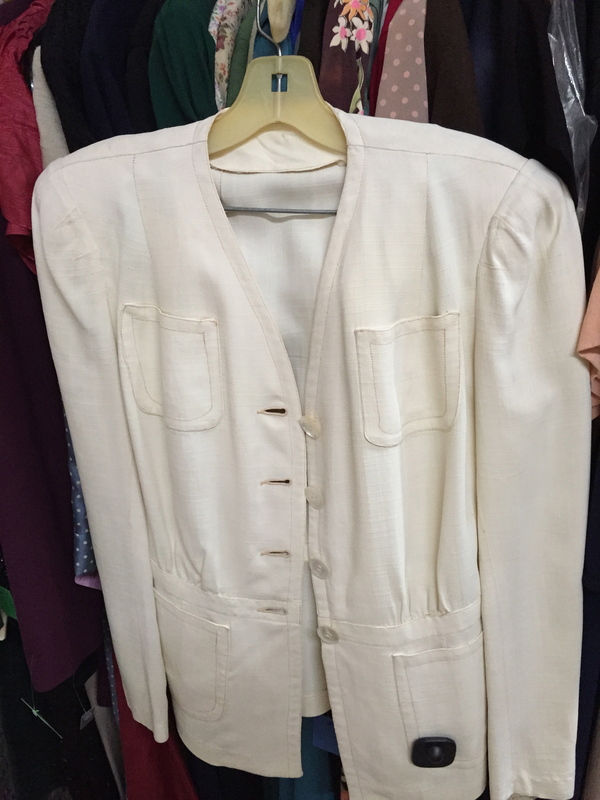 I’ll back up and say that the first thing I saw in the men’s section was a light tan/ivory belt back jacket, so when Rich walked in I asked if he had seen it. Upon retrieval, we discovered that it was his size – how serendipitous! But what are the chances we could find one for Skyler? 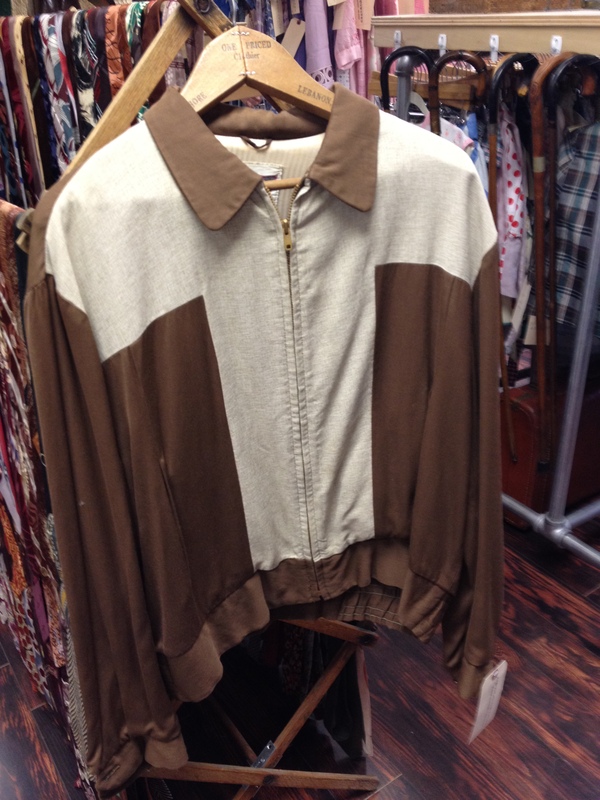 Luck was on our side and we found a similar jacket, a 70’s does 30’s belt back jacket for Skyler, as well! 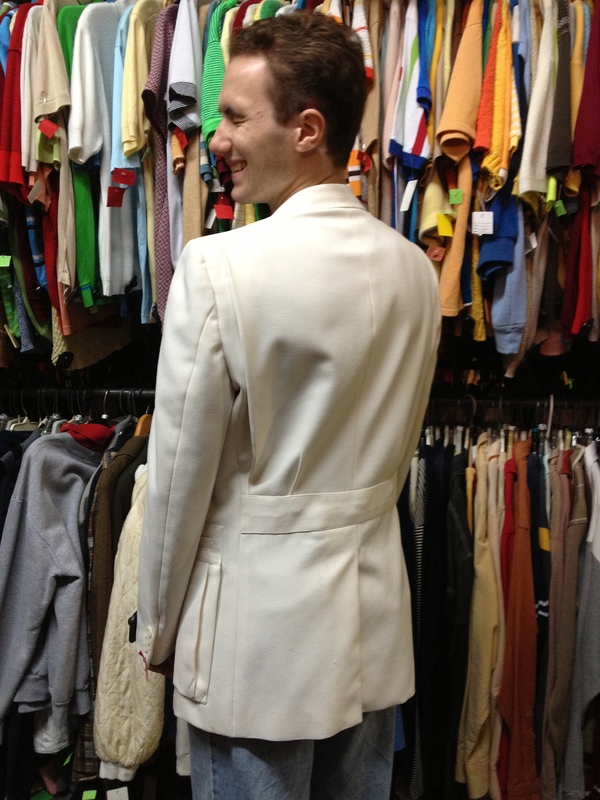 In the entire place there were only 3 jackets that came close to fitting Skyler, one slate blue double breasted kids jacket, a white cotton dinner jacket, and the belt back jacket. We set these aside and kept digging. Next up were pants, which yielded only two pairs that fit – a pair of tuxedo pants and a pair of gray and blue wool plaid trousers. Given our jacket discoveries, either could work, so we set those aside and continued, though by this point the digging had lost some steam. 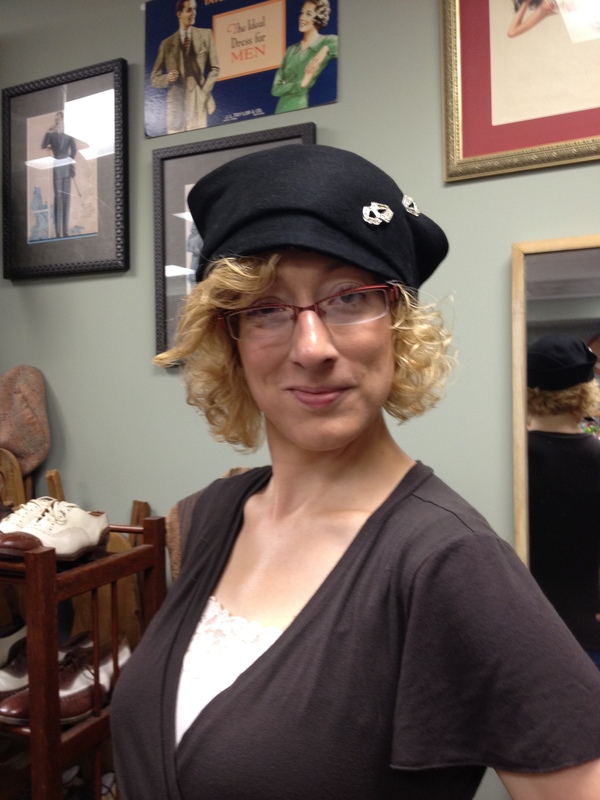 I took a mental break to check in on Rich and his fiance, Alisa Szatrowski, who had made her way through the limited selection of swing era garments. 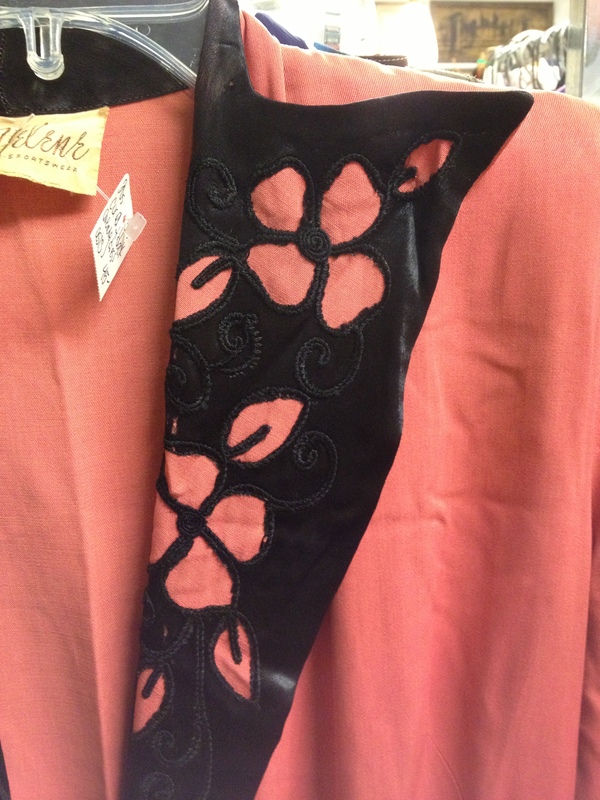 Half of vintage shopping with others is waiting for the discard pile, and I found a great cream 40’s dress with red soutache detail that hadn’t worked for her, but worked for me. Energized by the find, I returned to the Skyler search and we went through the vest rack together. 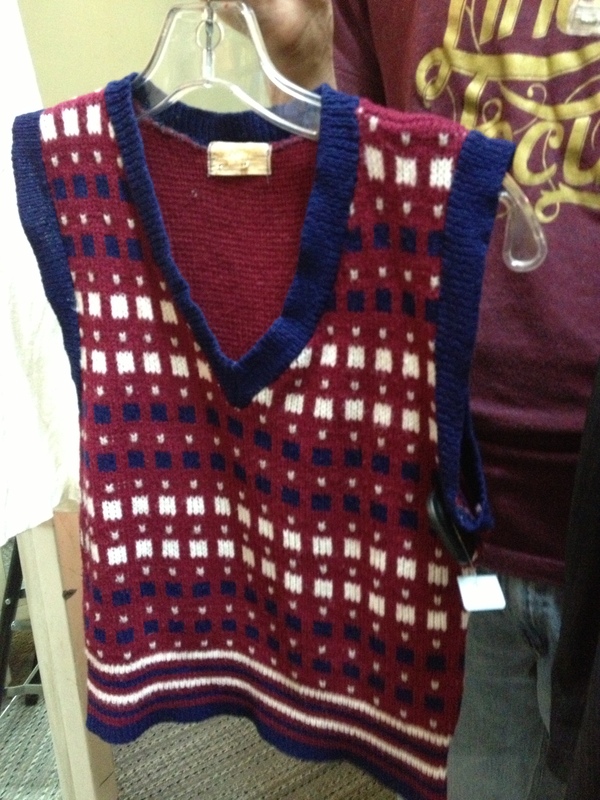 We culled a wool sweater vest from this search and now had the beginnings of a wardrobe. While it would be nice to be able to buy everything that fits us at vintage stores, practically speaking few of us make that kind of money. We decided that the belt back jacket would be more versatile, even though it was going to be a warmer jacket than the cotton dinner jacket. Thus, the tuxedo pants, were out and we headed to the checkout with (subtle) plaid wool pants, the belt back jacket, and the sweater vest. Not a bad day at the dig. On our way to the checkout we quickly sifted through the ties and found a perfect match for the vest. 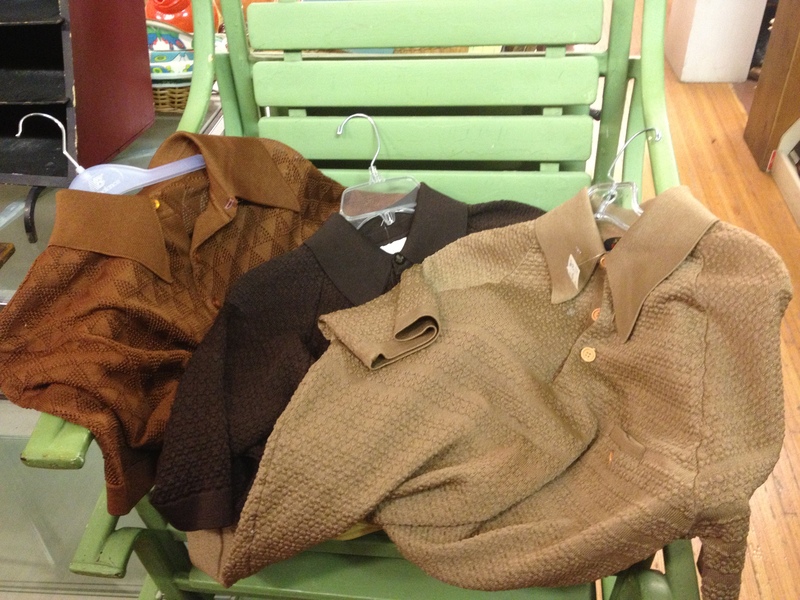 Total damage for these four items (jacket, pants, vest, and tie): $40.00. 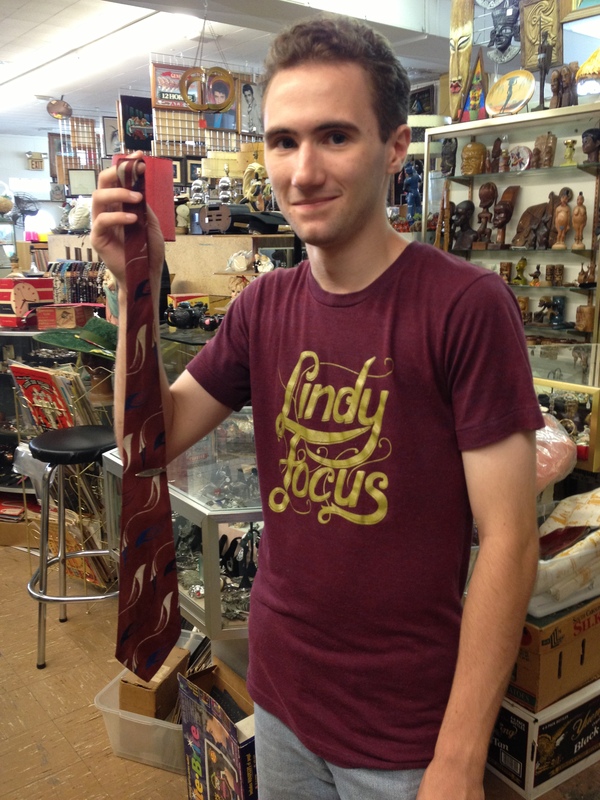 Two belt backs in one day – unprecedented! We headed back to the hotel, feeling good about the day’s purchases, and started planning the outfits; however, the critical component of white dress shirts for both outfits was missing, so we pulled over to a strip mall and found two white dress shirts in Target. Now, the only thing missing was a pair of pants to go with the sweater vest, and, if found, Skyler would have two complete outfits. I was hopeful that Skyler would find something at one of the vendor’s booths. The vendors opened at 5:00 p.m. and we were there just minutes before. While there were some great trousers there, none of them were the right size. 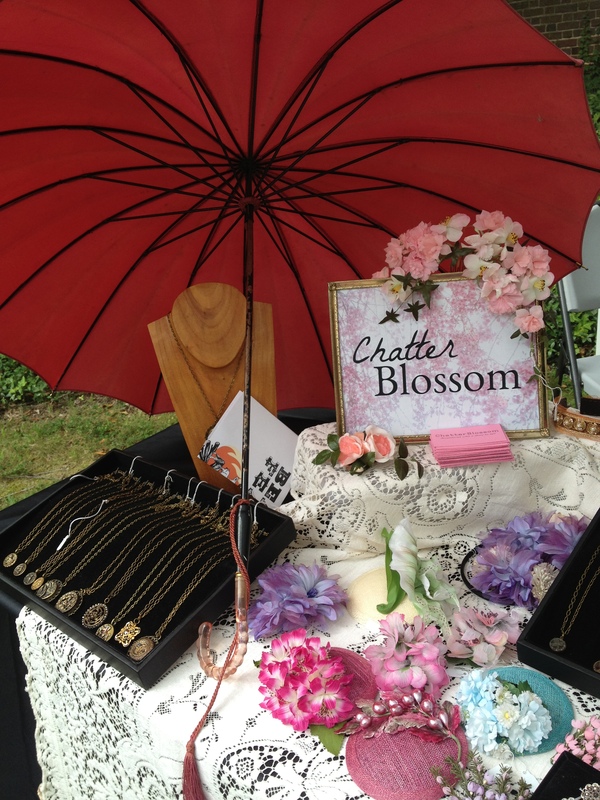 We talked to the ladies at the Flower Child booth and they said they would look in their inventory overnight. Later that evening, Chloe Hong’s booth opened up and, while they didn’t have any pants to sell off the rack, they did have sample sizes and I encouraged Skyler to try a pair on to see if they had his size and if he liked the trousers. He definitely liked Chloe’s pants the best out of all the trousers he tried on that day, so there was the option to increase his wardrobe by another pair of pants, even if he had to wait for them. We must always be forward thinking about our shopping! 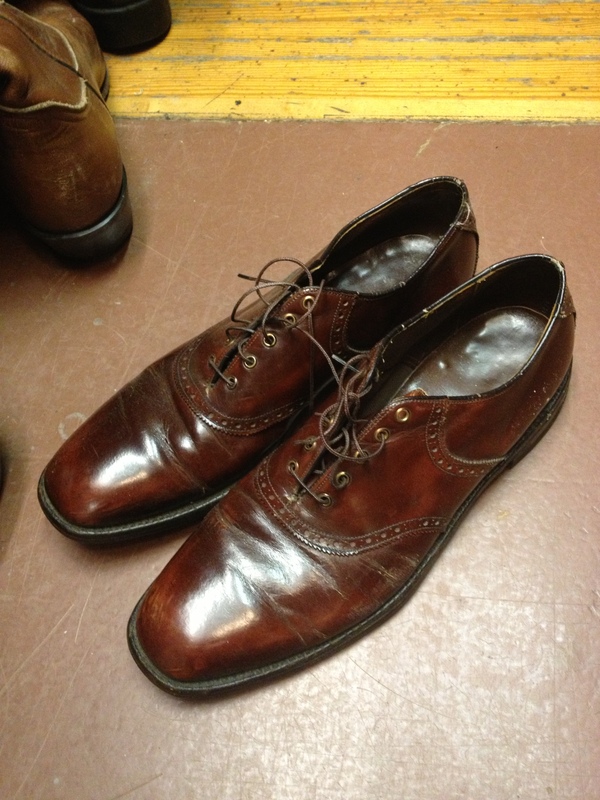 Last, but not least, Skyler had budgeted for a pair of Remix Vintage Shoes leather-soled shoes. 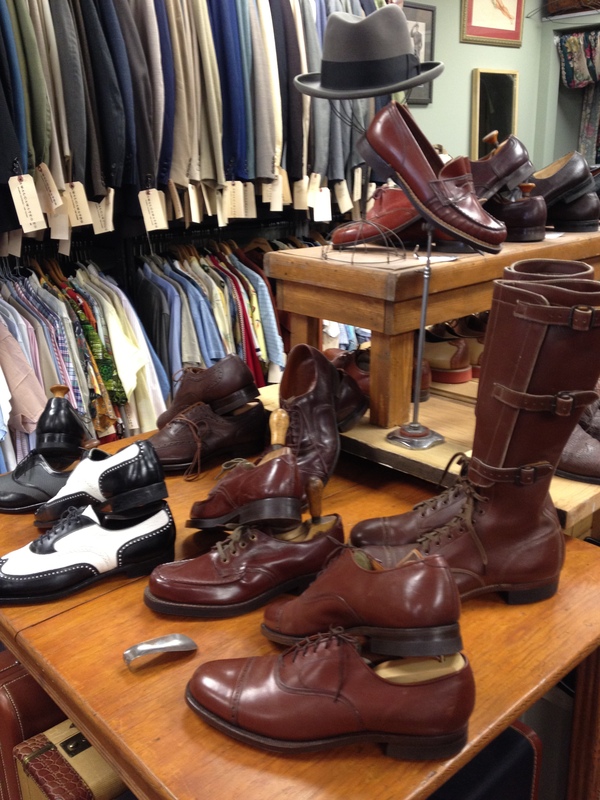 Their men’s cap toe is a beautiful shoe and, due to the constraint in inventory they can bring to ABW, they only had one pair in his size – thankfully, they were brown and white, which would look great with the navy-hued items, like the vest and the ties. We are waiting to find out if there is another pair of pants in store for Skyler…stay tuned! 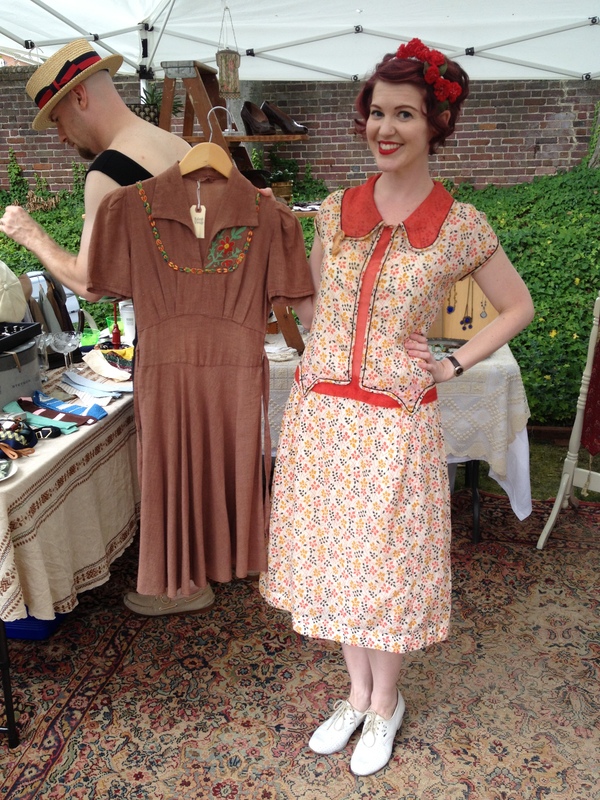 If you are a good girl and save your pennies, the Cleveland fairy will bring you vintage and repro on All Balboa Eve. Still basking in the afterglow of All Balboa Weekend, the Balboa Mecca that occurs every year in Cleveland, Ohio. It is a hub for so many things I love – good dancing, good music, good vintage shopping, good company, and good cupcakes. I left with a full heart and a shopping bag full of goodies – it was like Christmas! My first stop in Cleveland, per usual, was Sweet Lorain, the vintage department store where I seem to have the most luck finding things in my size. I was greeted at the door by the owner, Redwin Lewis, who remembered me from years past (and possibly phone orders – yes, you can call them back if you decide later that you really want/need something you saw, even 6 months later the item may still be there!) and we chatted about high school reunions and all the films (THE film being Captain America) shopping at his store. I was on a mission for a full slip with some sweet details and Sweet Lorain did not disappoint, with two full racks to choose from. 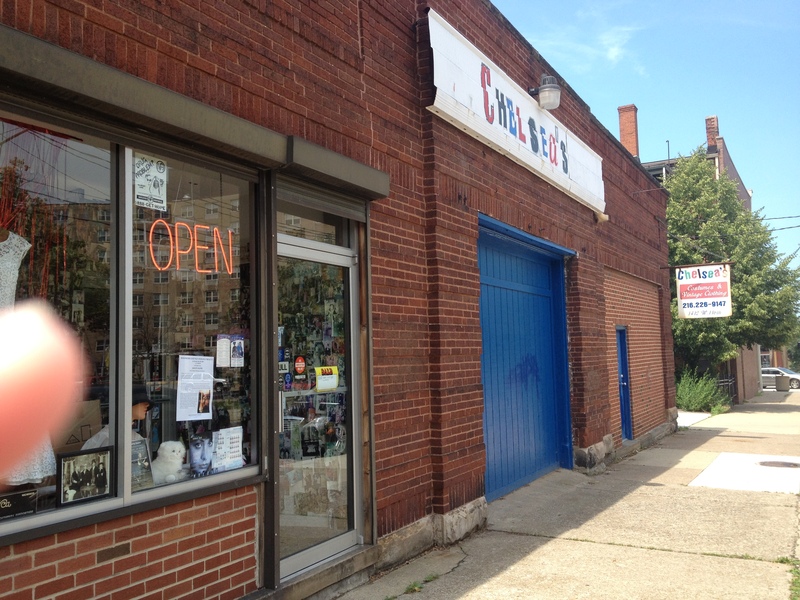 My next stop was Chelsea Costumes, which I had somehow managed to miss on all prior visits to Cleveland. The sheer volume of square footage packed literally floor to ceiling was overwhelming in a way that only a disorganized Goodwill warehouse of great magnitude could rival. The racks were three tiers high, with the top two racks reachable by rolling staircases located on each aisle. Adding to the library feel of the place, the ends of the racks were labeled by decade range. 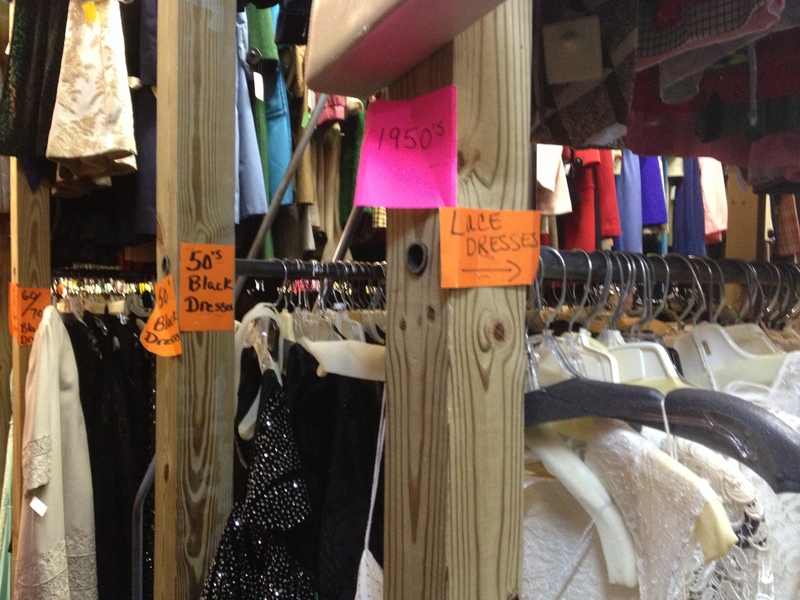 I searched in vain for the early vintage clothing and had to ask where it was located – at the end of one of the 1950’s racks was a single rack with 1940’s clothing. 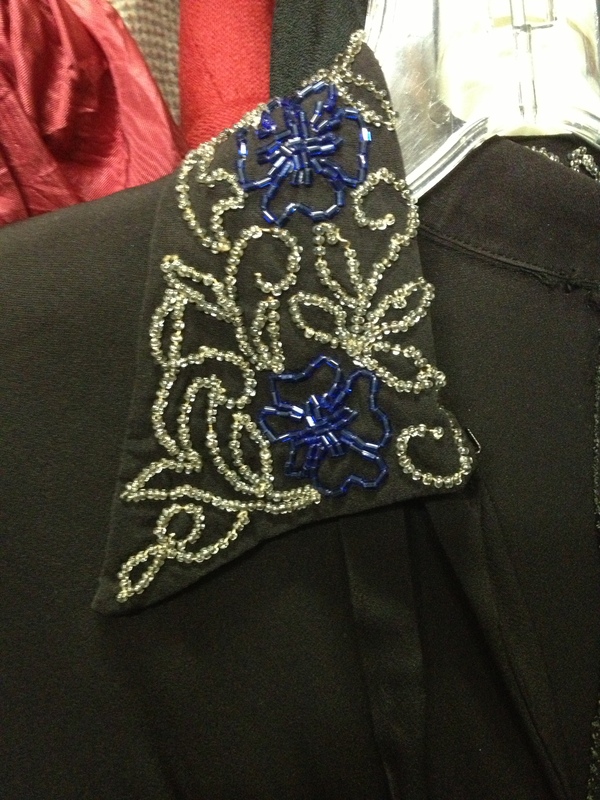 I found a couple of items I liked, but they had fatal flaws (fading, shredding, etc.). 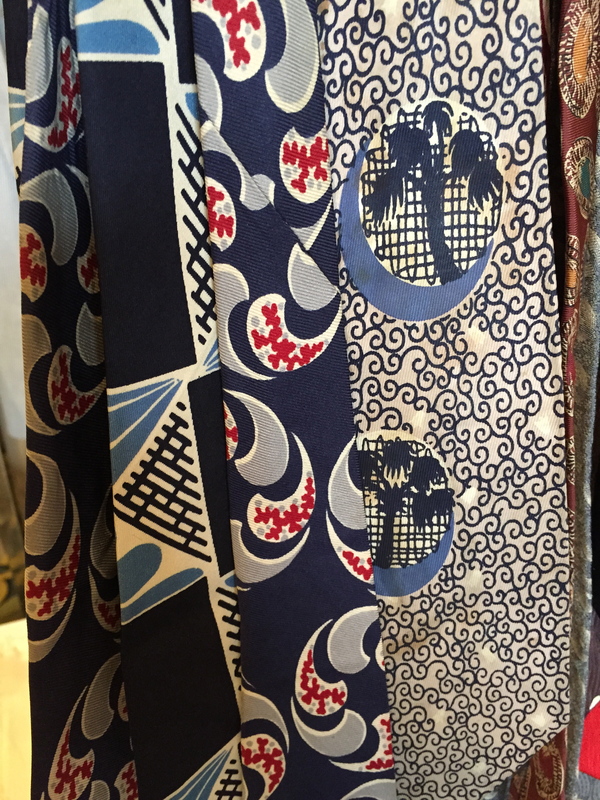 I’d say it’s definitely worth a look, especially if you are into later decades, and it’s an absolute must if you are looking for menswear – I saw just about every size, shape, color, item, and a range of seasonal weights, with a massive selection. You do have to be a digger to make this worthwhile, but the prices are good and worth the dig. 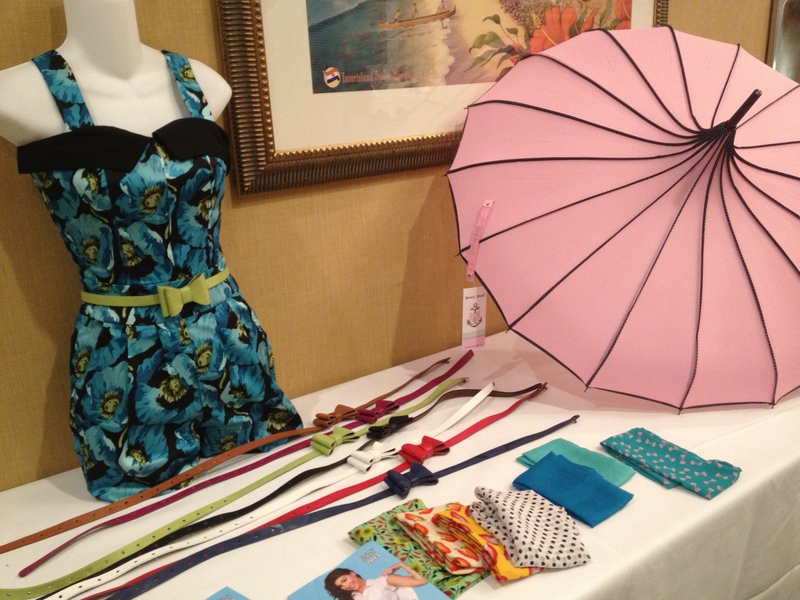 Back at the hotel, ABW had an array of vendors, some new, some old, that filled up the hallway in front of the ballroom. 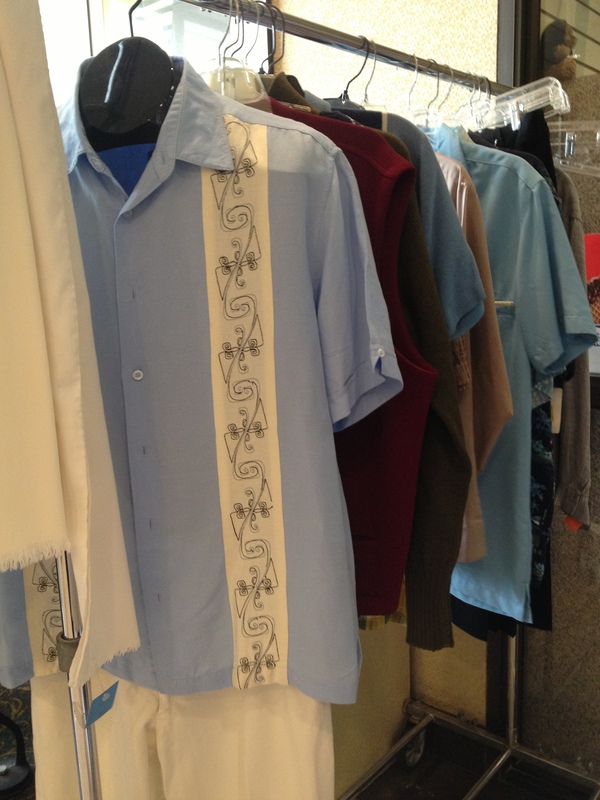 The first vendor was The Cleveland Shop, with an array of clothing and accessories for men and women. Favorites included some divine shoes, a burgundy silk 1930’s gown, and every dress that went on the mannequin and immediately sold. 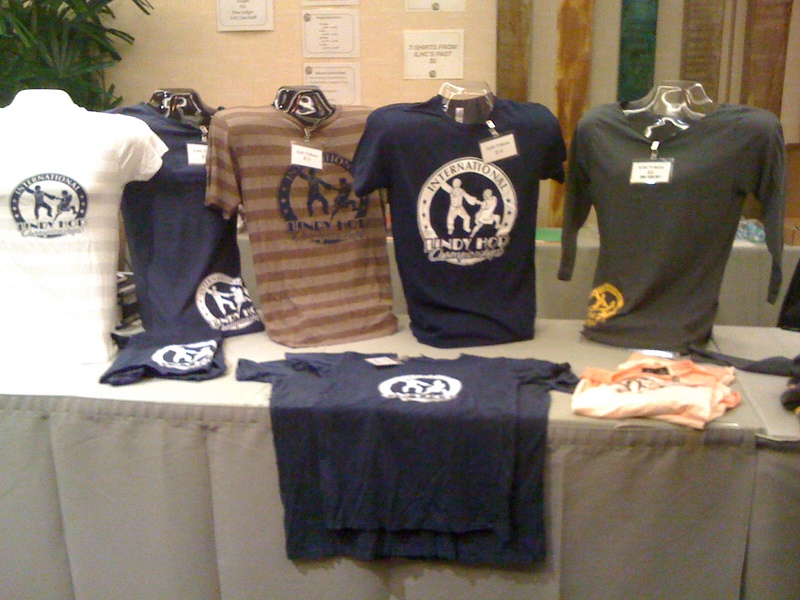 Next up was the ABW merchandise, which featured some cool shirts with stripes, a henley, and a girly slouchy tee with cool sleeve detail. 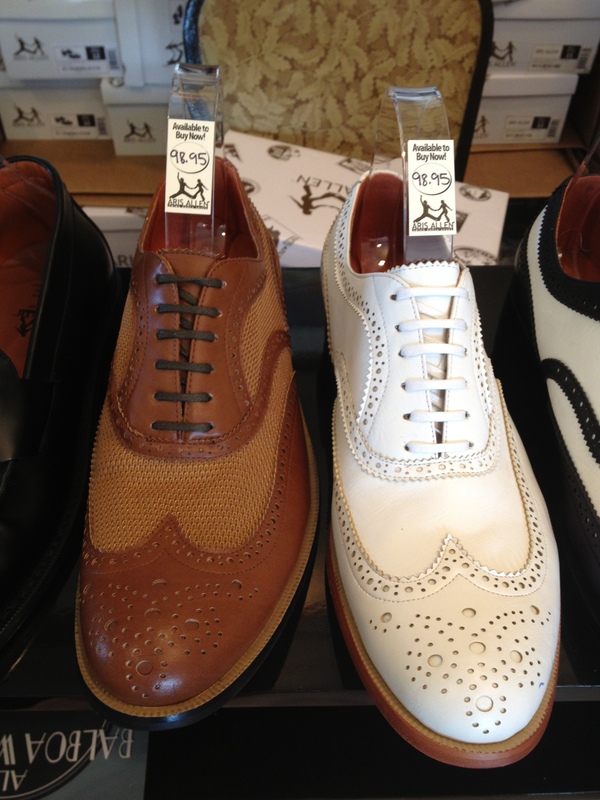 This year also saw the return of the ABW shoe bag – I do love a shoe bag! Bettie Page Clothing made its debut as a vendor this year, spearheaded by the lovely Shannon Butler, who is now the manager of the Bettie Page store at the Mall of America in Minnepolis, MN. 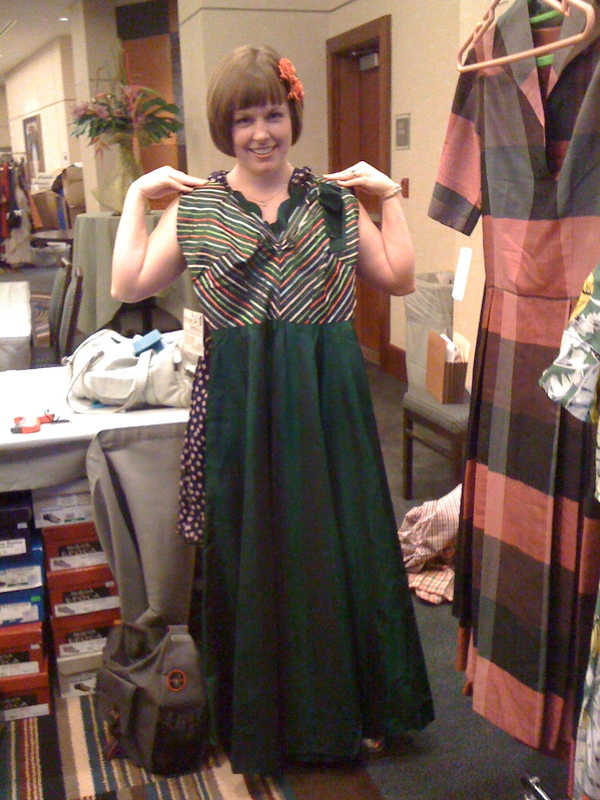 Shannon brought another innovative way to make sure everyone got to try on the clothing and get the sizes they need – she kept a stock of the dresses, shirts, and skirts she brought as try-ons and once you decided what you wanted, she called the Mall of America store, placed your order, and it was shipped to you (sometimes that day!) free of charge. In addition to all the adorable clothing, she brought these great adjustable belts that are the perfect dress belt, for when that vintage dress comes without a belt or maybe you lost the belt or want to add a belt…regardless, good, skinny dress belts are hard to come by and these babies are only $10 and come in several handy colors. Flower Child took up about half the hallway, with a wonderful display that moved from housewares and accessories, to jewelry, to several large racks of clothing at the end of the hall. Because Flower Child is made up of several vendors, there were a range of prices in the shop, and they definitely had the larges selection. 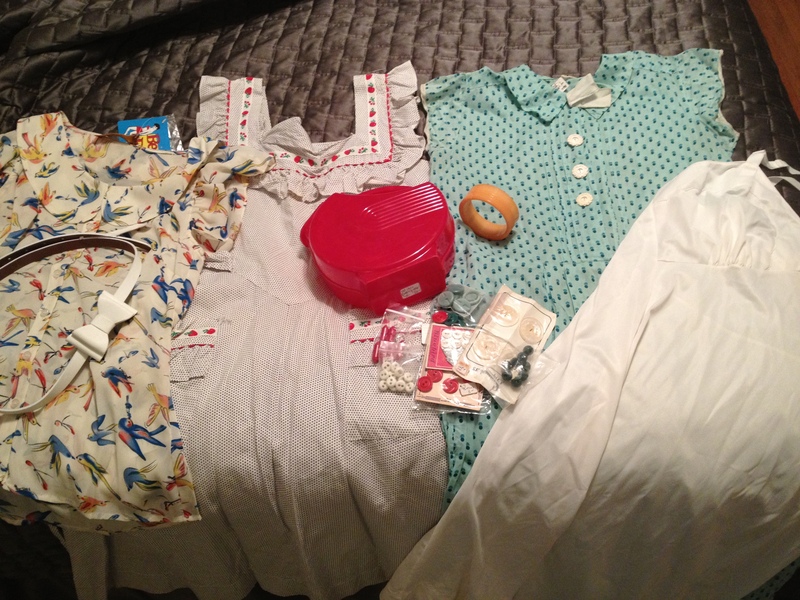 Favorites included a 1940’s gold bathing suit, rayon Asian print pajamas, and an adorable dress with strawberry ribbon trim that came home with me. Finally, Dancestore.com made an appearance with most of their line of shoes. I liked that they had a set of “try-on” pairs that you could put on and take for a spin during one dance. It helps you decide, cuts down on wear and tear of new pairs, and also gives you an idea of how they will feel once they are broken in. Great idea! 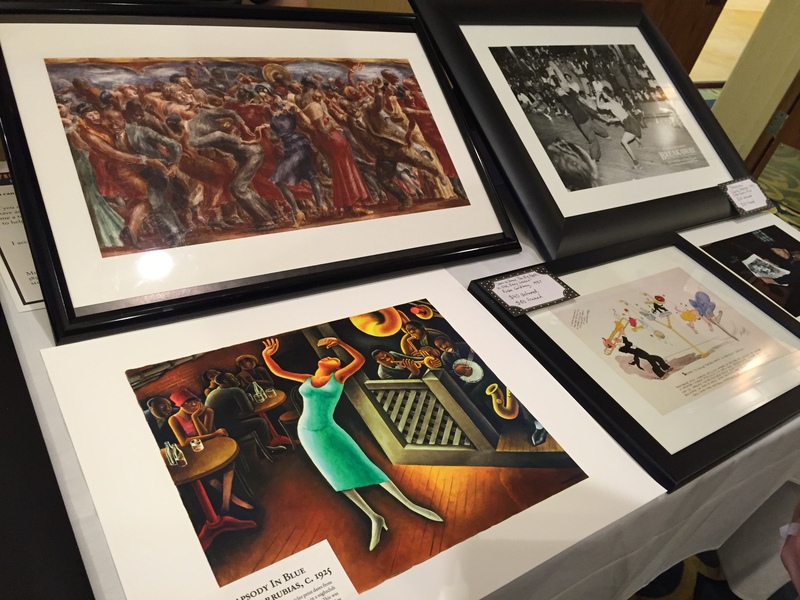 This year was probably the best year for vendors yet – many of the vendors are veterans at this point, they know their audience, and they only bring the best stuff as it pertains to swing dancers. I am elated that they continue to come out, year after year. Here are my photos from the weekend – enjoy! Did you know these came in GREEN? 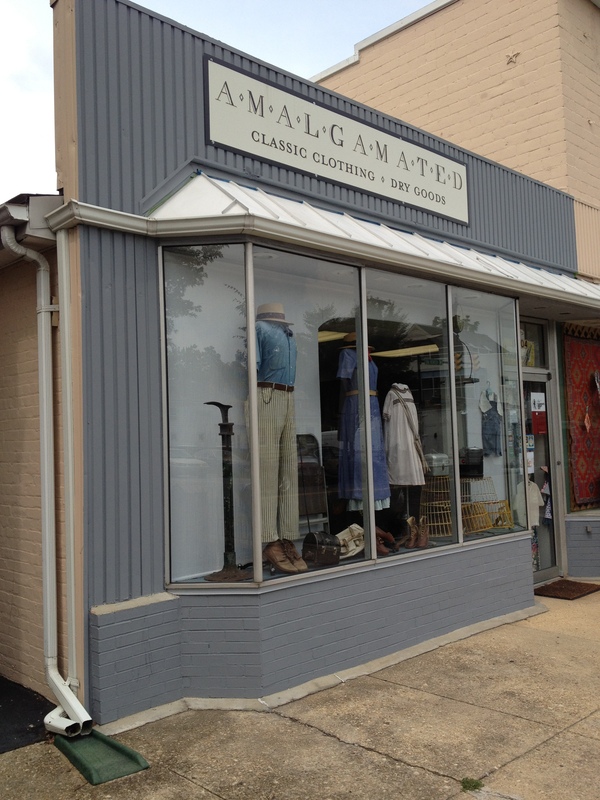 I have anticipated checking out Alexandria’s Amalgamated Classic Clothing and Dry Goods since April, when I heard of its opening shortly prior to DCLX and the wonders that awaited me – rumors that the owners have a warehouse where items are pulled for Hollywood movies, that the inventory has real swing era stuff, GOOD stuff, and I was salivating. As I ditched the Saturday afternoon DCLX dance to head over to Alexandria I got a text message from Bill Speidel that the shop was closed. Oh, the disappointment! Thankfully, I had already planned to attend the International Lindy Hop Championships in August, so I knew I’d get a second chance. I messaged the store’s Facebook page a few days prior to the event to make sure that they would be open and should I send my measuremnets. The answers were yes and yes, and I was elated. 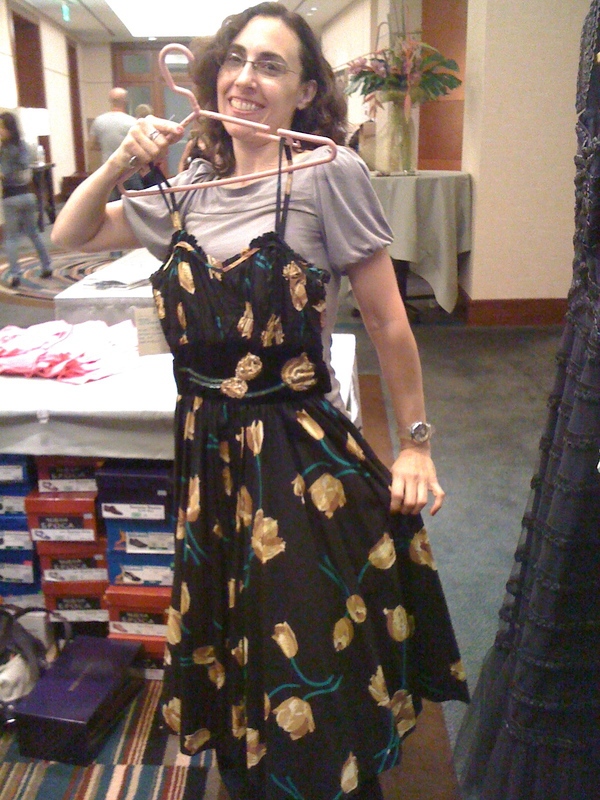 It took us three hours to get through everything in the store and try on the rack of clothes that Beth and I accumulated through our collective digging through the store. 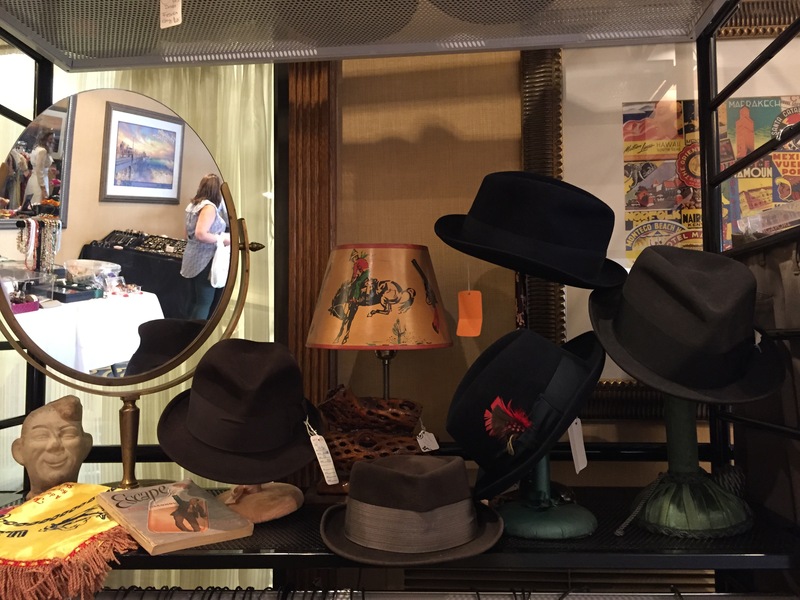 The store itself is small is square footage, but packed with everything good – there was no small rack where the few swing era items were delegated – the entire store was pre-1960’s, so 100% of their inventory was everything that you would want to see in a vintage store. It was glorious! 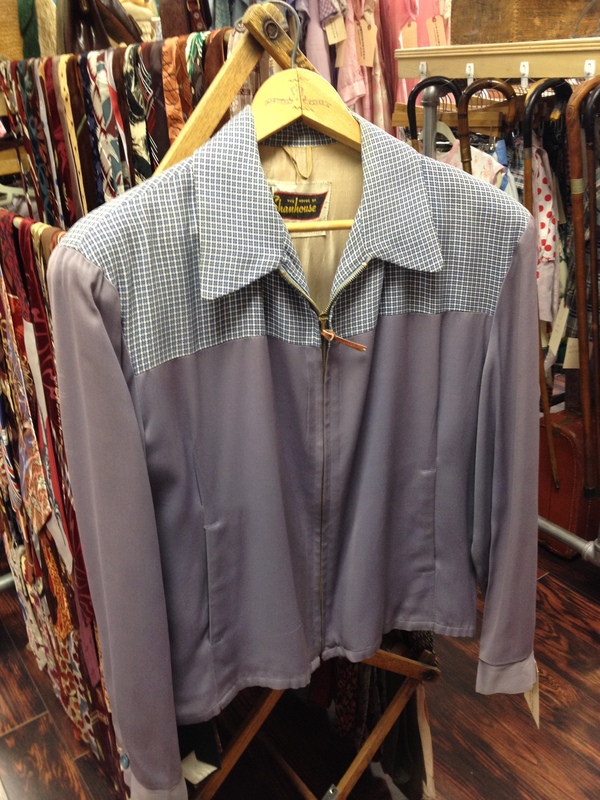 The men’s section rivaled the women’s section in size and magnificence (who has an entire rack devoted to two tone Ricky Ricardo jackets?) 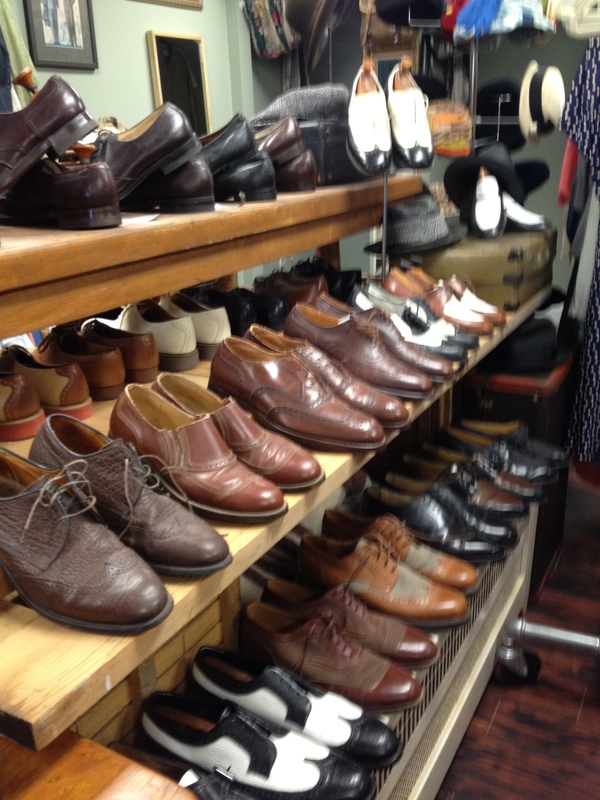 and a men’s shoe section that took up an entire table, and included children’s shoes (tiny leather and mesh oxfords!). 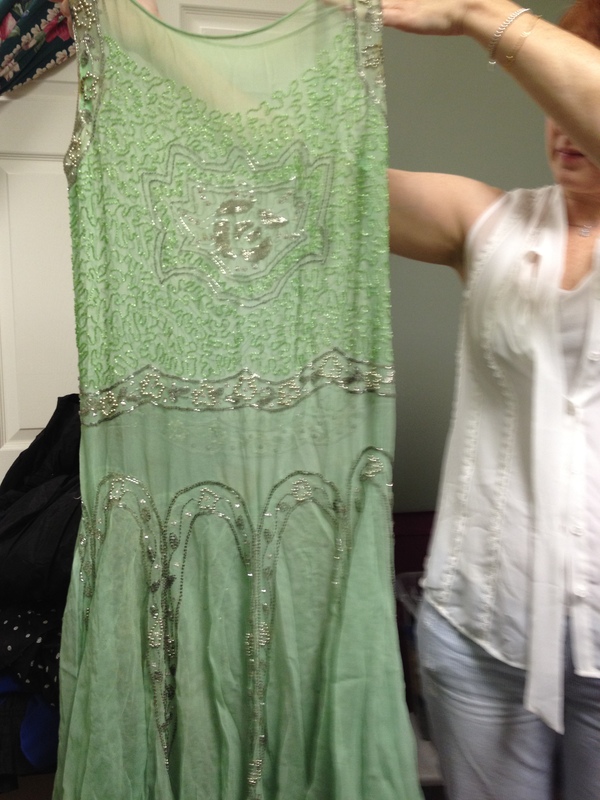 Owner Shelley White took us through boxes in the back room filled with delicate 1920’s beaded dresses, there were racks of glorious dresses and gowns, plus some very practical items that would be perfect for dancing. 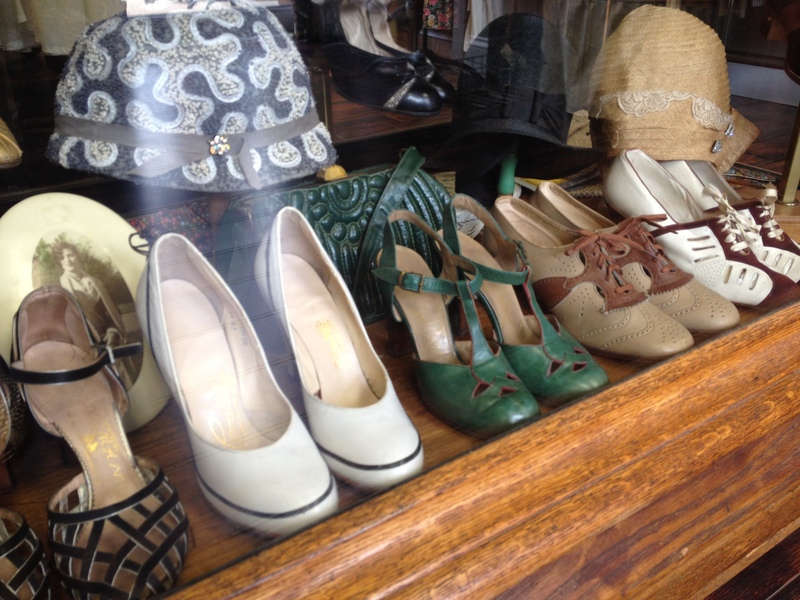 The women’s shoes had a good selection of larger women’s sizes, which was great for Beth, who picked up a pair of fantastic 1940’s heels. 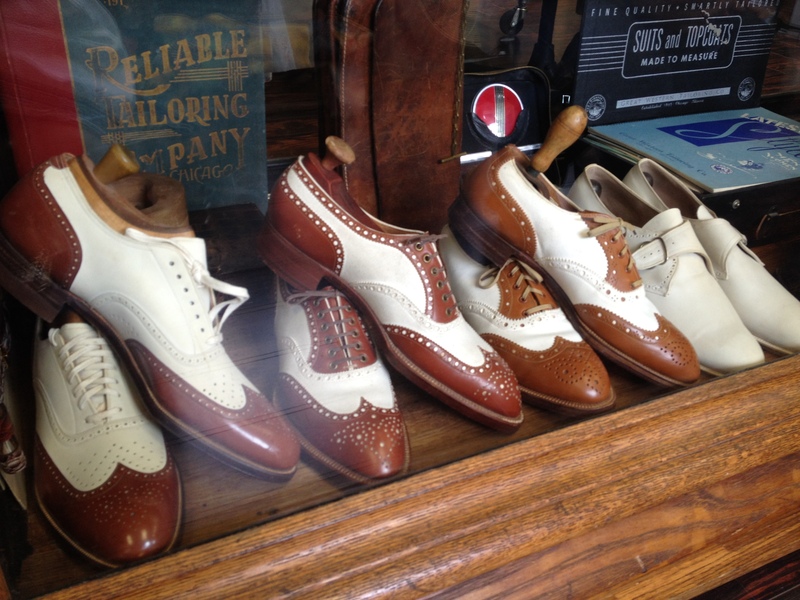 The more choice men’s shoes behind glass. 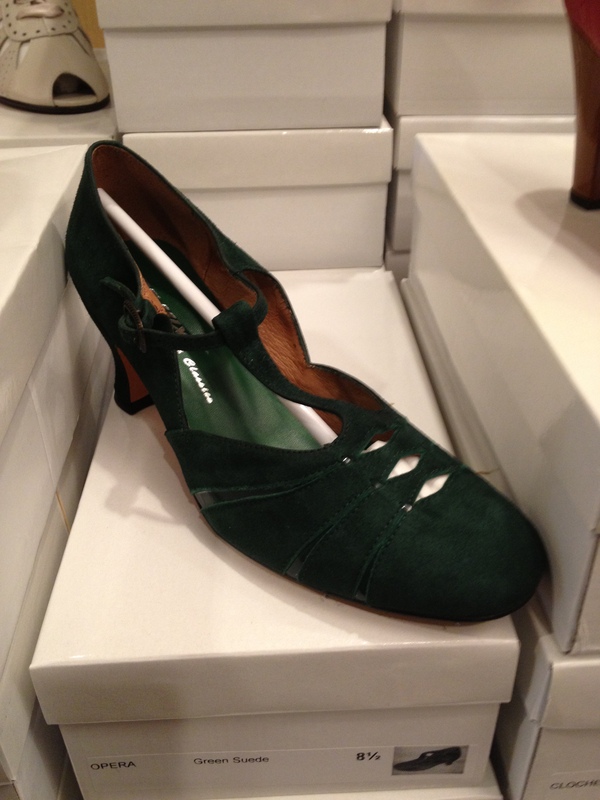 The more choice women’s shoes behind glass – if you wear a size 5, those green t-straps could be yours! 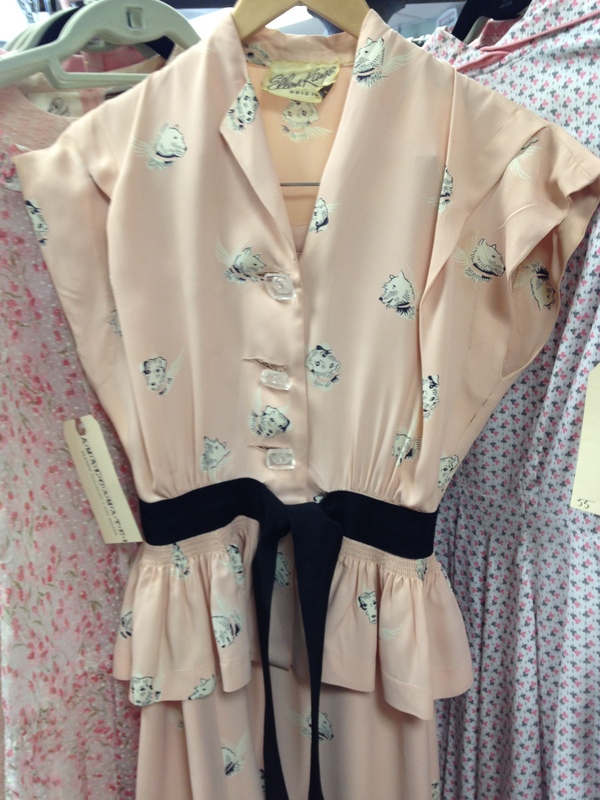 On closer inspection, the print on this adorable 1940’s suit with giant lucite buttons features winged puppies! Does it get any cuter than freakin’ winged puppies??? 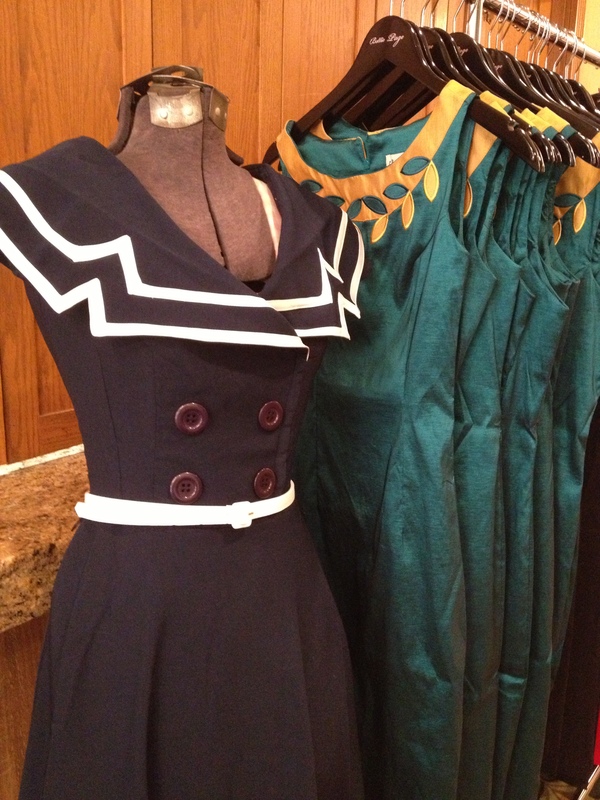 Love this green 50’s dress, with a white scalloped stripe across the upper torso to draw the eye up and GIANT POCKETS. 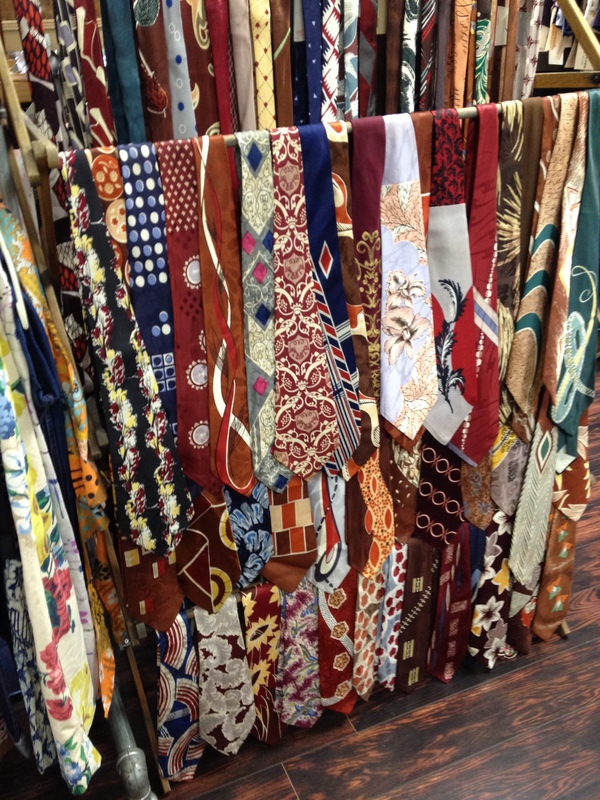 Tie rack includes dead stock ties as well as used vintage ties. 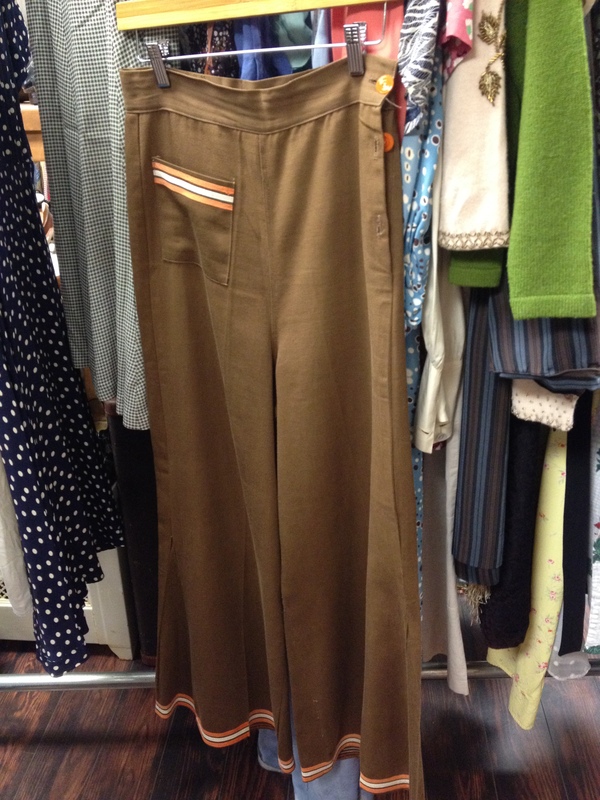 Wide leg high waist women’s pants with adorable trim. 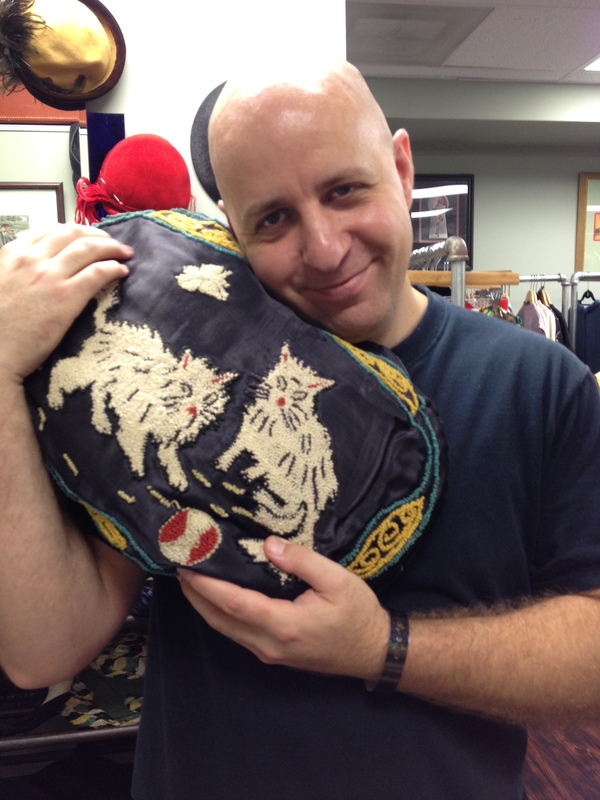 Jason snuggles with a vintage cat pillow. 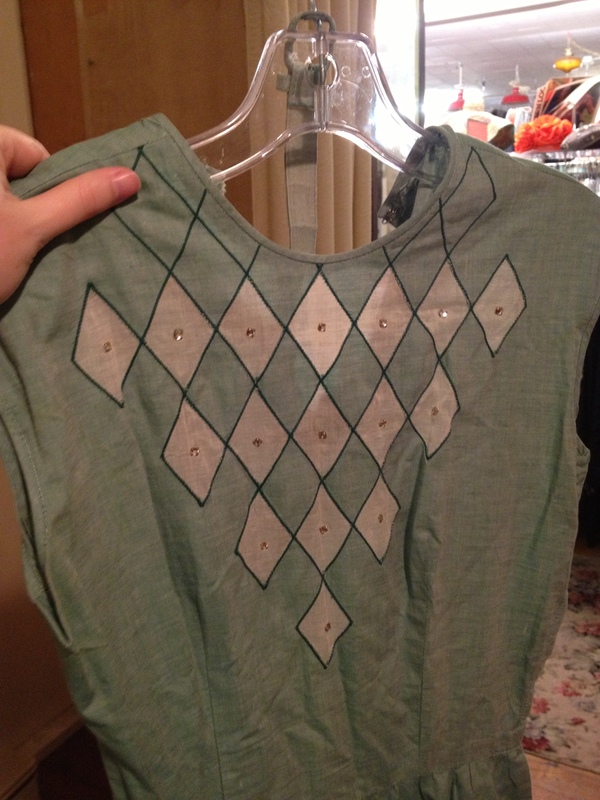 A 1920’s beaded dress in my favorite color. 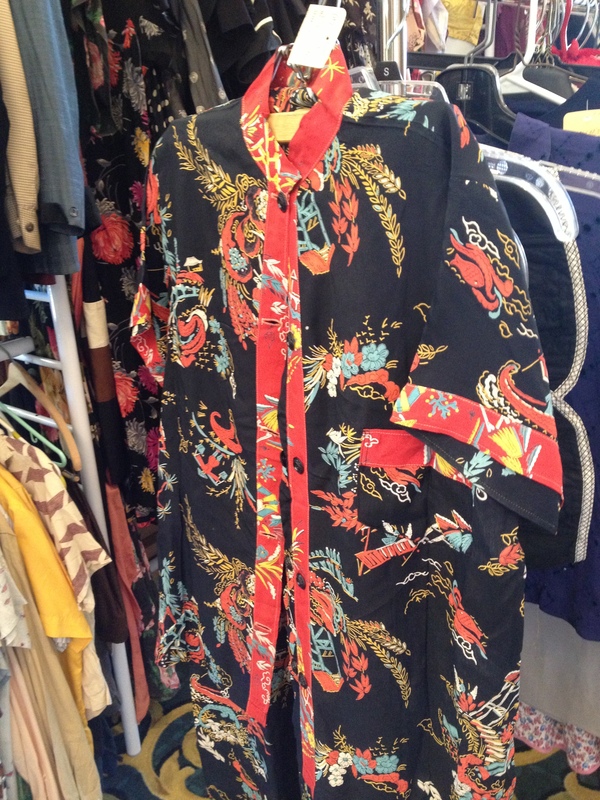 Love this Asian-inspired shape in a cotton leaf print. 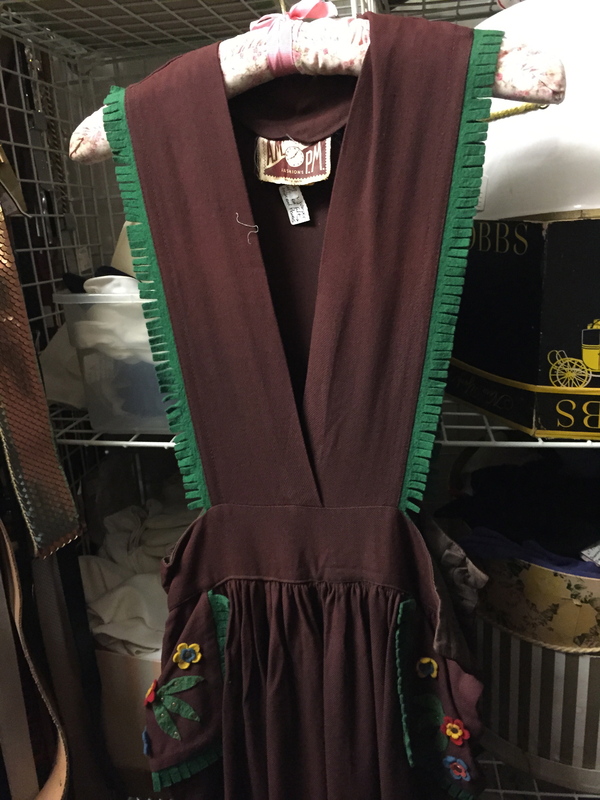 In spite of the naysayers, I’d like to share my love and philosophy about vintage clothing and perhaps refute some misconceptions or perceptions about vintage clothing in the process. I’ve come up with a list of reasons why I think vintage clothing is worth adding to my wardrobe and why I enjoy vintage clothing so much. If you are looking for sheer quantity of clothing, then vintage clothing probably isn’t right for you, unless you make a lot more money than I do in a year. What I am looking for is quality clothing, something that fits well, is made with nice materials, and will withstand the test of time. I’ve watched a lot of What Not To Wear in my life and Clinton and Stacy always talk about spending a little bit more on clothes to get items that will look more luxurious and quality to improve your overall appearance, clothing that you can wear for years, not just this season. 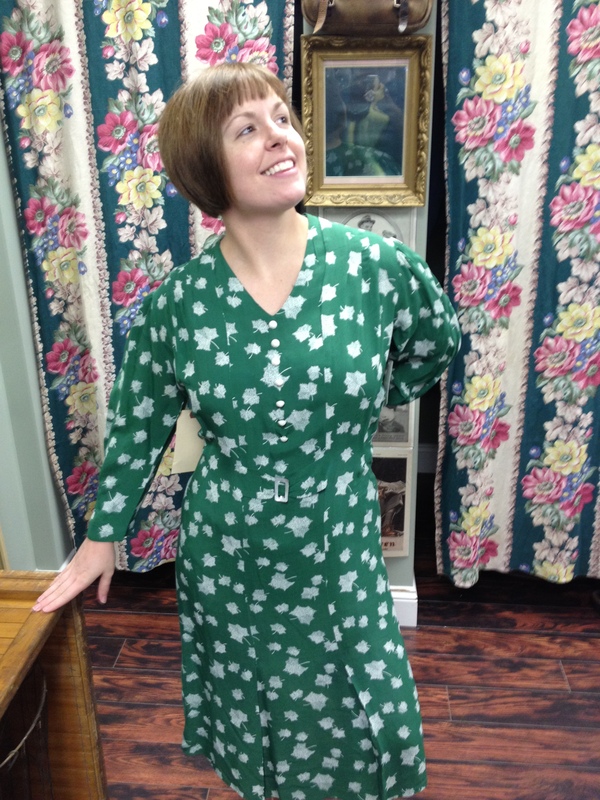 I’ve mentioned in a previous post that I don’t spend any more on a vintage dress than I would in a modern retail store. That said, I generally pay less for a vintage garment that has more tailoring and details than I would for a comparable new dress. The same holds true for all used clothing – with new clothes you are paying for the new-ness of the garment, the salaries of the people who made it, and the company who is marketing the clothing. 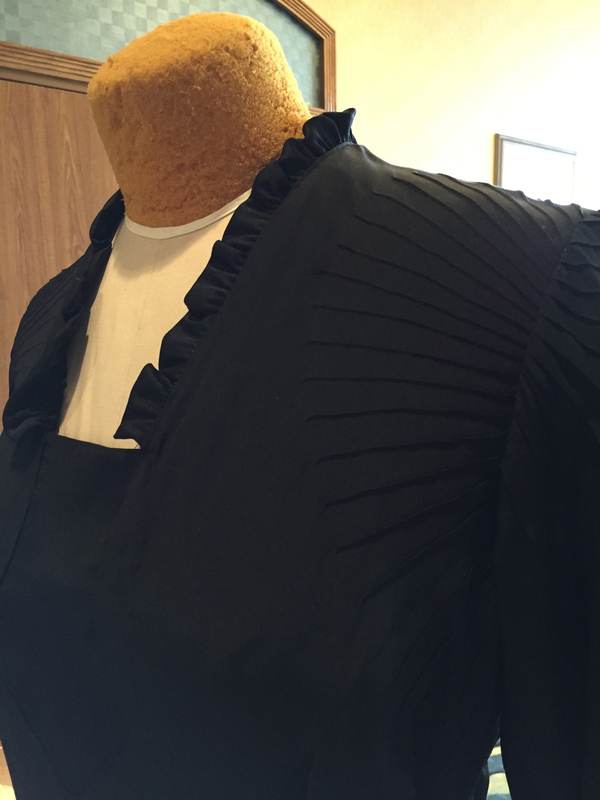 If I can get the same or better details for less money and the only difference is that the garment is old or used, I’m going to go with the more cost-effective option. 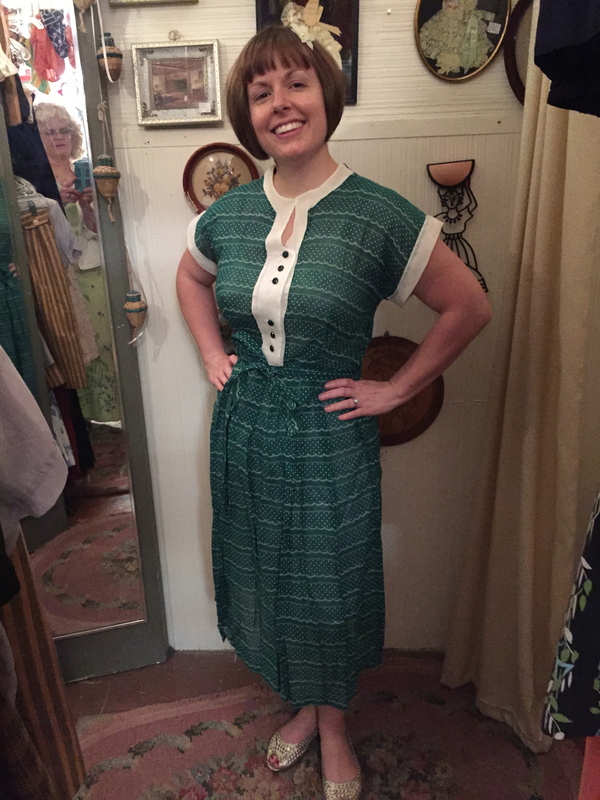 I’ve talked in the past about how vintage clothing was made for people of all sizes, not just tiny people, but I also find that vintage clothing just fits me better than modern clothing and is often easier to tailor than modern clothing. Modern clothing is made for the most common size, whatever that happens to be, and doesn’t take into account that everyone has a different bust/waist/hip ratio. If you are a little bigger on the top, bottom, or middle, that ratio isn’t going to work for you, especially if something is supposed to look “fitted.” Checking size charts can be deflating, especially if your bust, waist, and hip measurements land you in 3 different sizes. 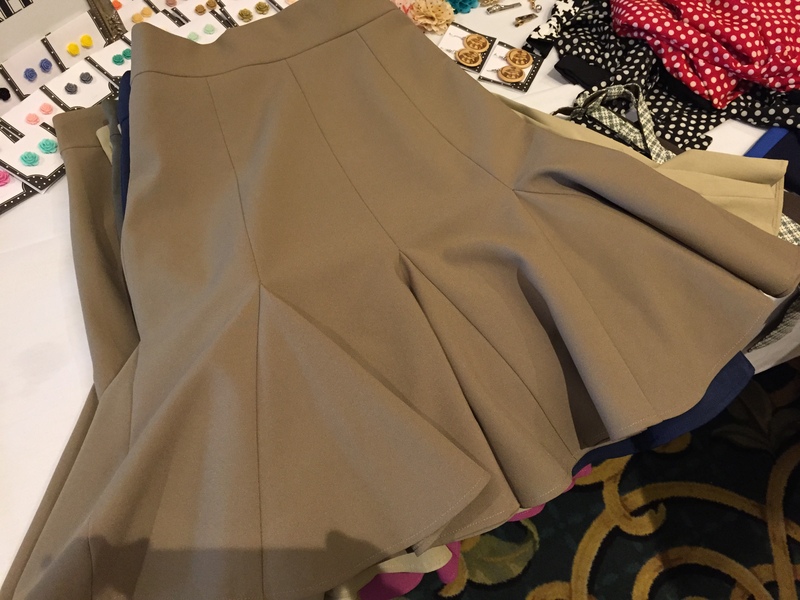 With vintage clothing, I find that the ratio can be more forgiving – generally fuller skirts, belted waists that can be cinched, and more ample areas in the bust because of how the garment was supposed to be worn. With eBay and online vintage stores, I am able to search for garments that fit my exact measurements, making fit even less of an issue. I don’t like strapless or spaghetti strap dresses because I want the comfort of supportive undergarments; however, I am hard pressed to find dresses with sleeves, even in the winter, in modern retail stores. They want you to buy a jacket to go over it, or you have to find a cardigan. What if I want sleeves and a cardigan because I’m cold? I just find the whole thing impractical. 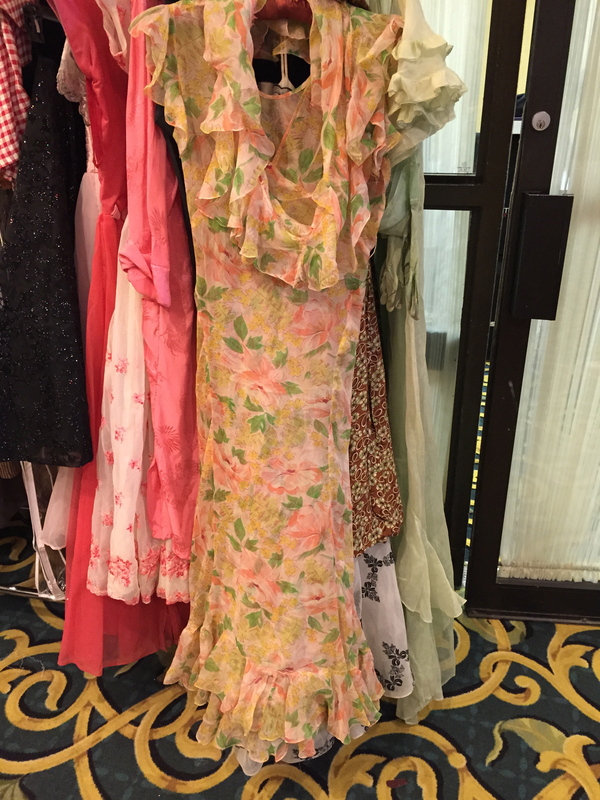 I generally find it easier to find a vintage dress with sleeves in my size than I do finding a dress with sleeves at the mall – I think that’s saying a lot. If you buy an article of vintage clothing, the odds of someone else having this exact article of clothing is slim to none. 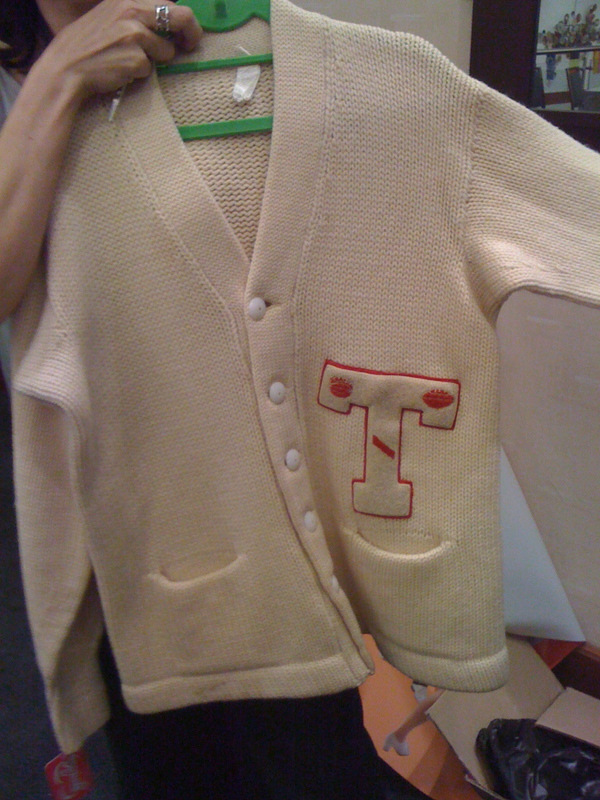 Much of the clothing of the swing era was hand made, not mass-produced, but even the mass produced items are rare and far flung. 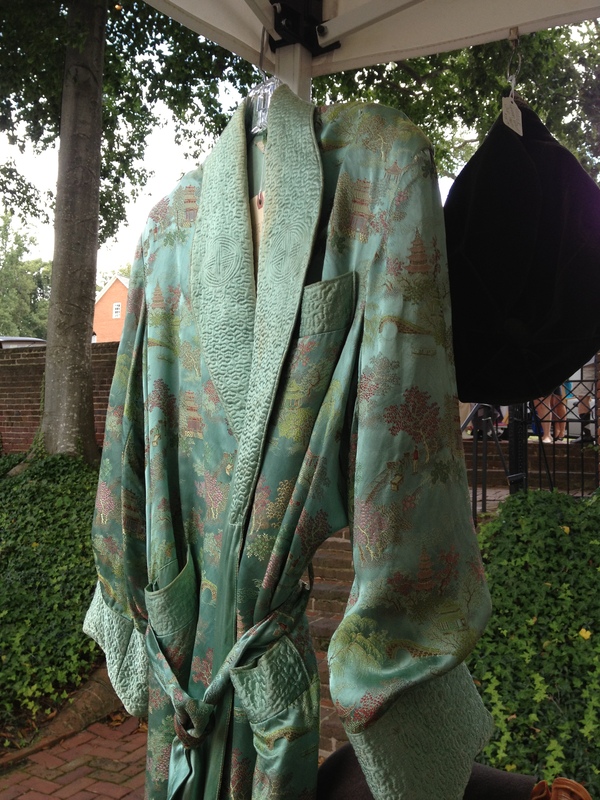 I’ve only come across a couple of items in multiples, one being a dressing gown I found at both Design Archives in Greensboro, NC and on eBay and the other being a 1940’s dress I wore at Lindy Focus last year that several people insisted was exactly the same as a dress owned by Naomi Uyama. Aside from those rare exceptions, my vintage wardrobe remains one-of-a-kind and I think there’s value in finding your own style via these unique garments. Designers are inspired by the designs of the past. It’s that simple. You can look at just about any garment and relate its shape and design to some article of clothing created in a past decade. In my opinion, most of the time, the past did it better. I’ll admit it, I feel really special when I wear vintage clothing. Clothes from the past tended to be more dressy than today’s jeans and tee shirt uniform (which I do still wear), so when I wear something vintage it’s because I’m going somewhere special, so I want to look special. Maybe I want to be going somewhere special every day, so I try to wear vintage dresses as much as possible so I feel better about myself, even when I’m not going somewhere special. 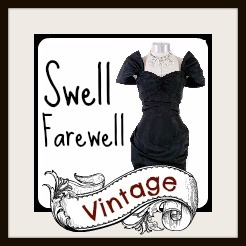 Vintage clothing can definitely elevate your look, your mood, and your surroundings, and I find that people smile more at me when I wear vintage. I feel like there’s been a lot of talk about sustainability and being conscious about the environmental impact of our clothing purchases and, while I didn’t initially purchase vintage clothing for this purpose, it’s certainly an incentive to continue to do so. I like to think that I am rescuing this clothing from the garbage heap, keeping its wonderfulness alive while eliminating its clutter and deterioration in a landfill. I’ll agree that this is a labor of love. I think some people get frustrated because they treat a vintage clothing store like they would treat a store at the mall. When you are shopping for vintage clothing you have to shift your approach, know that not everything comes in your size, and be patient. Just like any good wardrobe, building it takes time. I’ve been collecting vintage clothing for over a decade now and I’m just now getting to the point where I feel like I have a vintage outfit for almost every occasion. The result – a wardrobe that I love and adore – has been worth the wait. 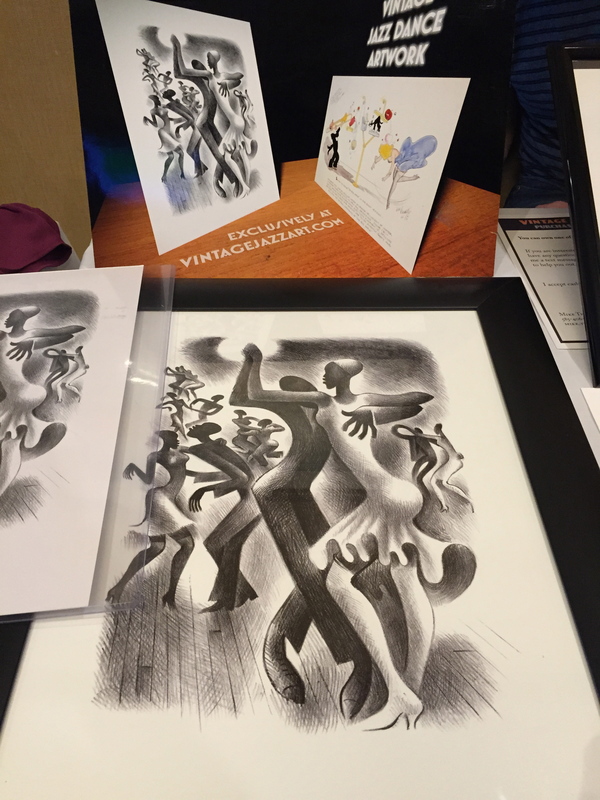 I had the pleasure of dancing and competing at this year’s International Lindy Hop Championships, held just outside of Washington, D.C. in Alexandria, Virginia. The event was a unique mix of swing dancers, in varying styles of dance, from around the globe. I think the event is best summed up by saying that ILHC is where you can see all those people you see dancing on YouTube – but there’s nothing better than seeing it live, as a video can’t quite capture the energy these couples and teams generate or the dynamic in the room. 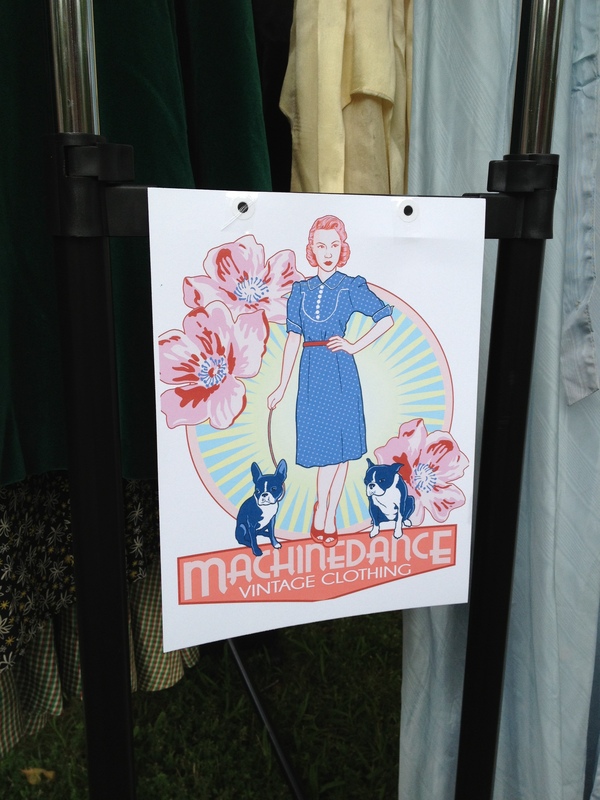 Like most large swing dance events nowadays, ILHC had its own set of vendors, most of which I would categorize as the “essentials” providers – shoes, bloomers, hair flowers, and vintage/vintage-inspired clothing. Baltimore-based Dancestore.com was there with a lineup of Lindy and Bal-friendly shoes, including their new pair of white wingtips, which look gorgeous in person. 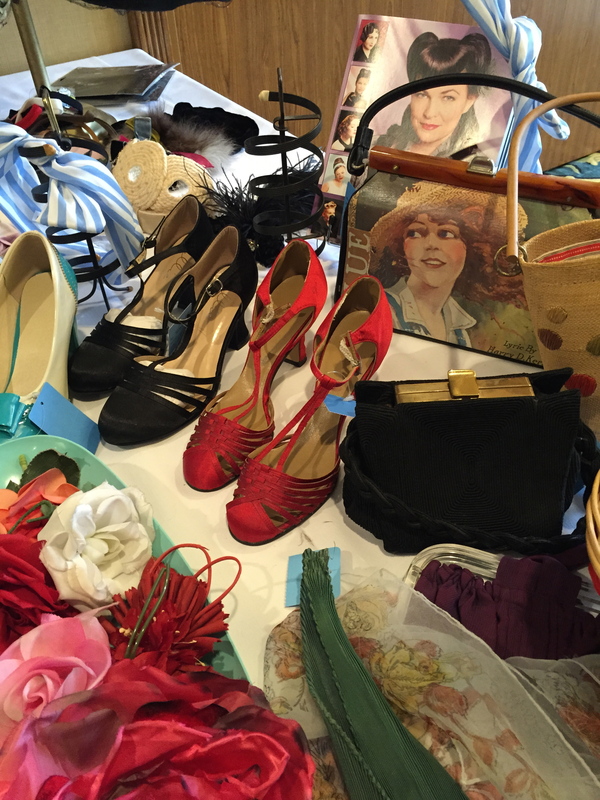 Nina Gilkenson‘s mom, Laurie Gilkenson, was on hand, selling shoes for Dancestore, as well as vintage odds, ends, clothing, and shoes from Nina’s vintage shoe collection. If you wore a size 6.5, it was definitely your lucky day! More photos below of this and the other vendors. Forties Forward had an array of new hair flowers, since I last saw these gals, Erica DeBlasio and Michelle Postles, at Lindy Focus. My new favorite bloom was a giant white bloom, possibly a magnolia blossom, that was so large it could almost be a hat! 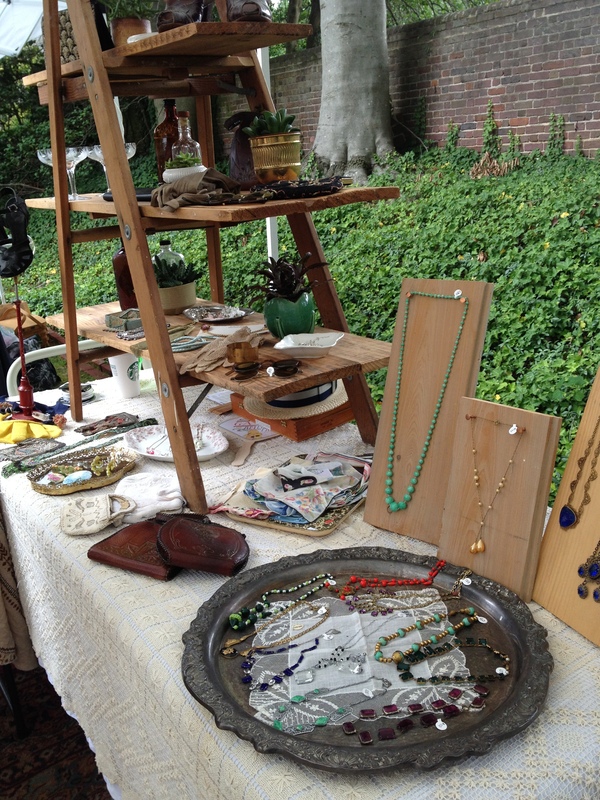 Thanks to everyone who organized the event and to those sold their wares at IHLC! I hope to return next year! 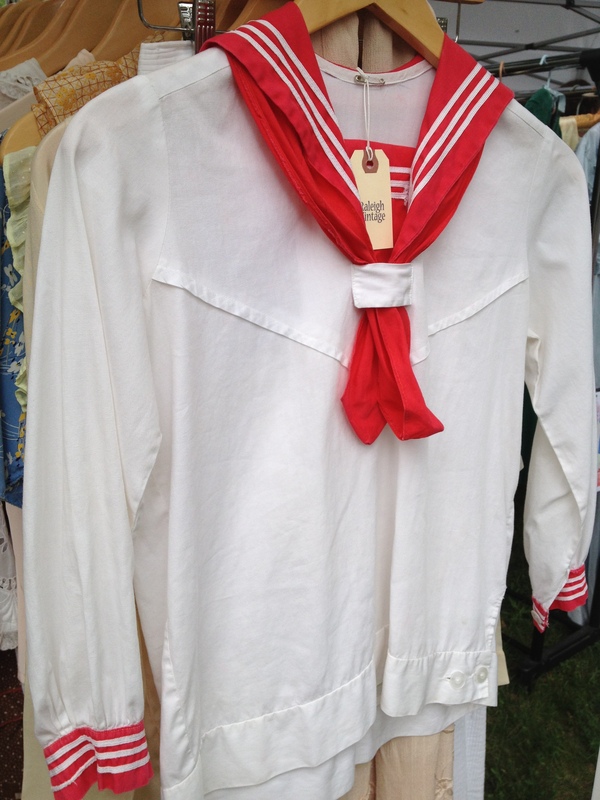 I have received a request from Laurel Carpenter to write about evaluating vintage clothing prices, based on the tendency of some vintage retailers and eBay sellers to overprice their vintage pieces. What is worth it? 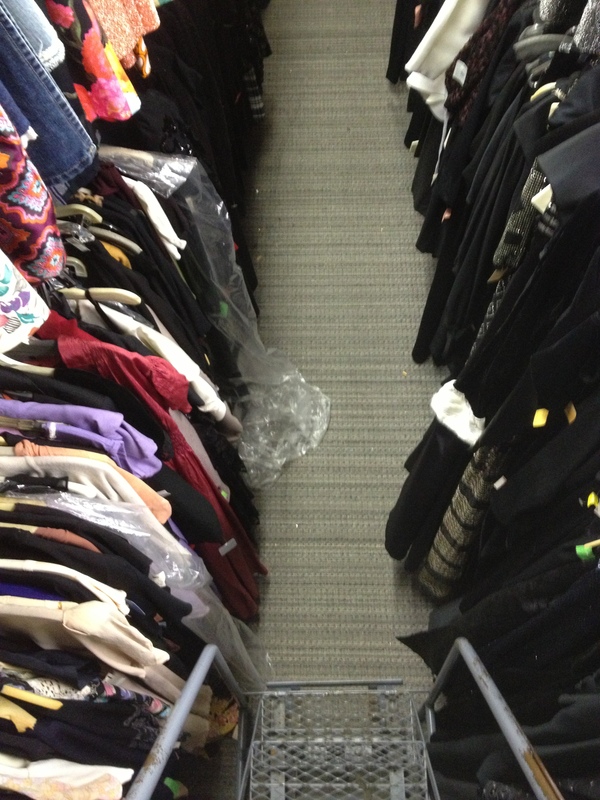 What should you leave on the rack or the proverbial auction block? 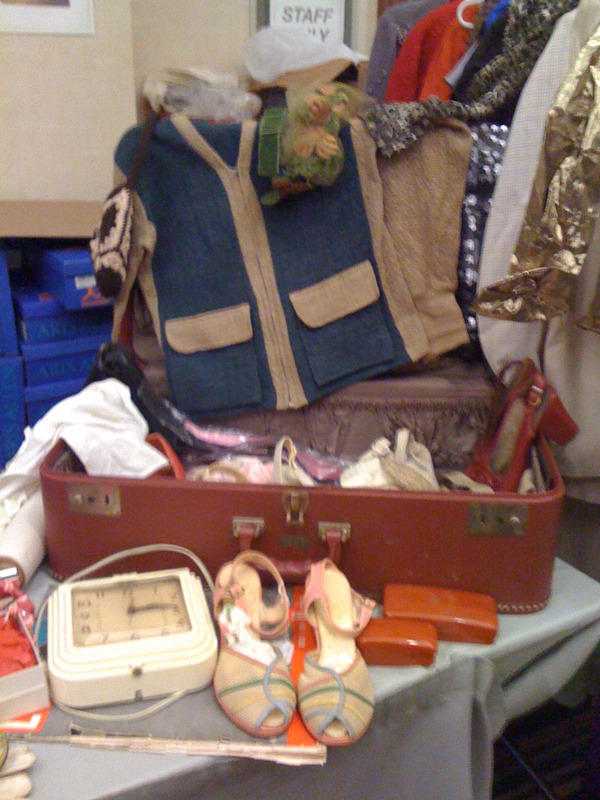 I have found that this becomes a very personal decision, based on your income, the priority of incorporating vintage clothing into your wardrobe, the availability of vintage clothing in your geographic area, how well the garment fits, how much you like the garment, the condition of the garment, the similarity to other vintage items in your wardrobe, the cost of any potential alterations, and occasions to wear a particular garment, among other factors. When I go shopping for vintage clothing I sort of run through a series of questions based on these factors. 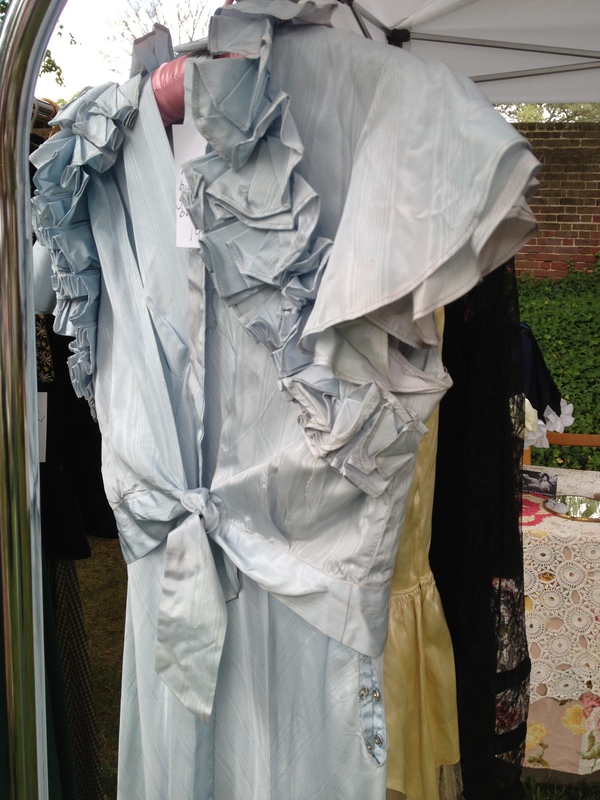 When it comes to the price of vintage clothing I look at things on a sliding scale – the garment is more valuable to me if it fits like a dream, it is unique and flattering, and in great condition. And if it’s green, I’ll be willing to pay even more. 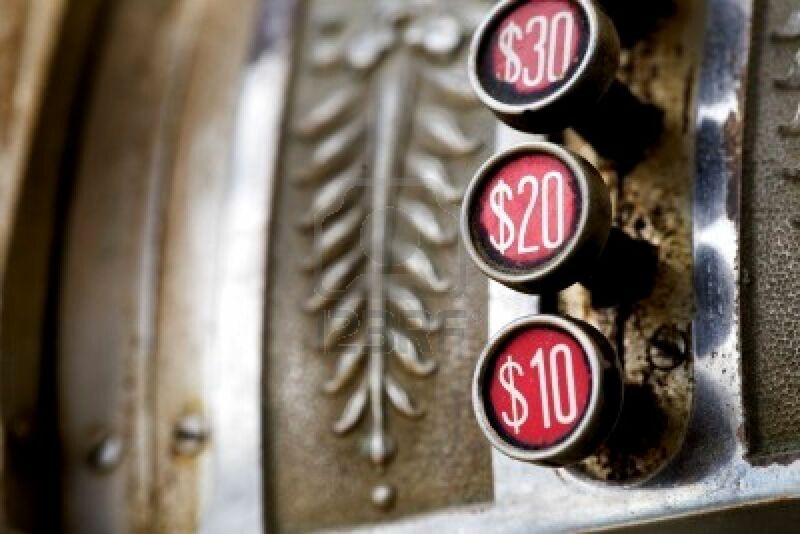 🙂 However, just because it is old doesn’t mean that it is worth hundreds of dollars and just because it is vintage doesn’t mean that I’ll open my wallet any wider than I would if I shopped at the mall. I’ll speak generally about prices, focusing on swing era garments, which are a rarity in your average local vintage store and more plentiful on eBay. Some sellers just want more money for their stuff – they either live in an area where people pay these prices or they think they’ve hit the jackpot at an estate sale and have dollar signs in their eyes. 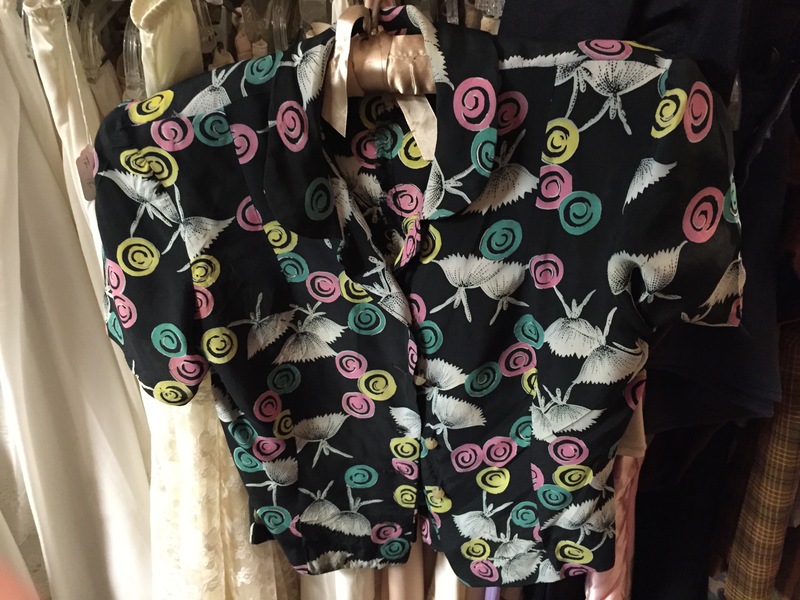 With the advent of eBay, these rarities have become more available to the masses and I have noticed the prices of vintage in my area either going down or staying the same as when I started shopping for vintage clothing, around 1999. It’s become more competitive, which is good for you as the consumer, to have a wider selection at competitive prices. 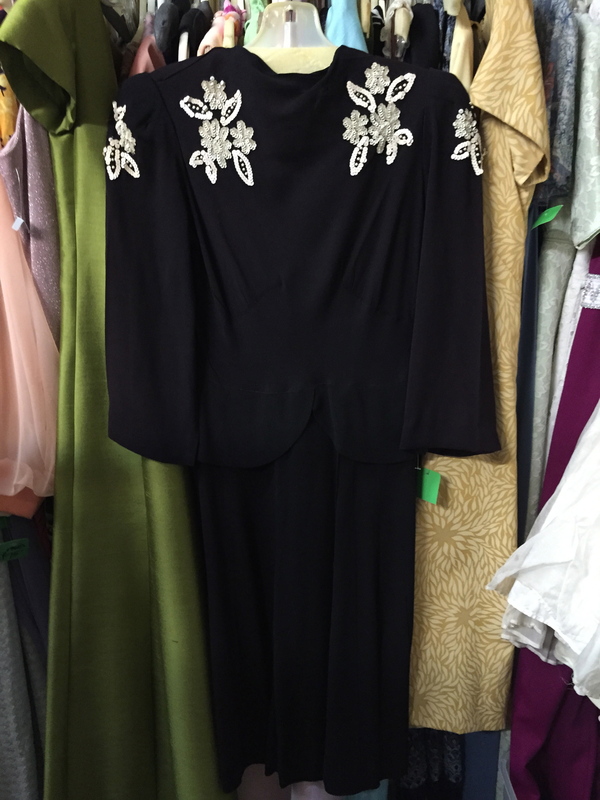 1920’s clothing, due to its age and fragile nature, tends to cost more because most of the materials in clothing from this era have deteriorated – to find something in excellent condition from the 1920’s is rare. 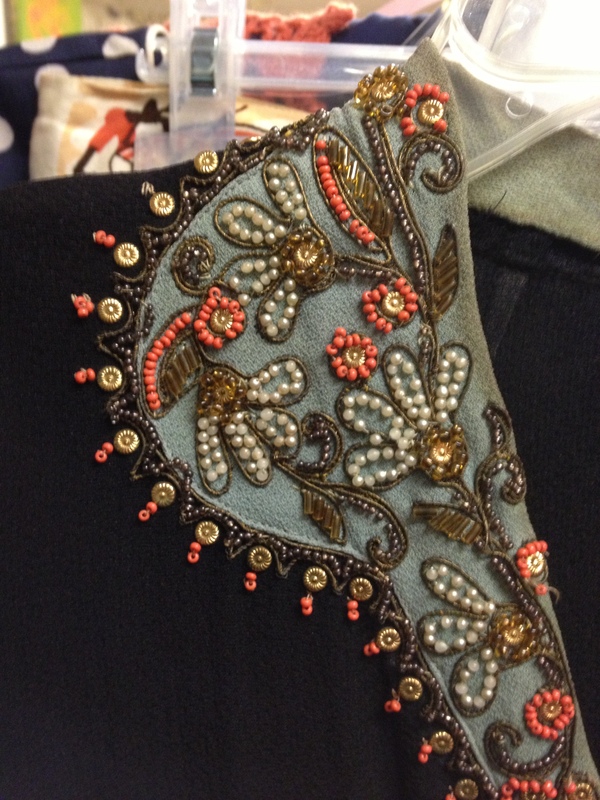 To translate that into cost you have to consider how good the condition is and how fabulous the item – do you pay $1,000 for the beaded 1920’s dress/gown? No, no, don’t do that – would you spend that much on an evening gown? Maybe your wedding dress, but consider how old this garment is, the likelihood that the fine mesh will deteriorate, and what happens if it gets a tear or the beads start coming off? Devastating. Do you pay $200 for it? Maybe. If it fits you like a glove, you can Charleston in it without shedding beads, and you have the perfect occasion to wear it, then consider it a viable option. 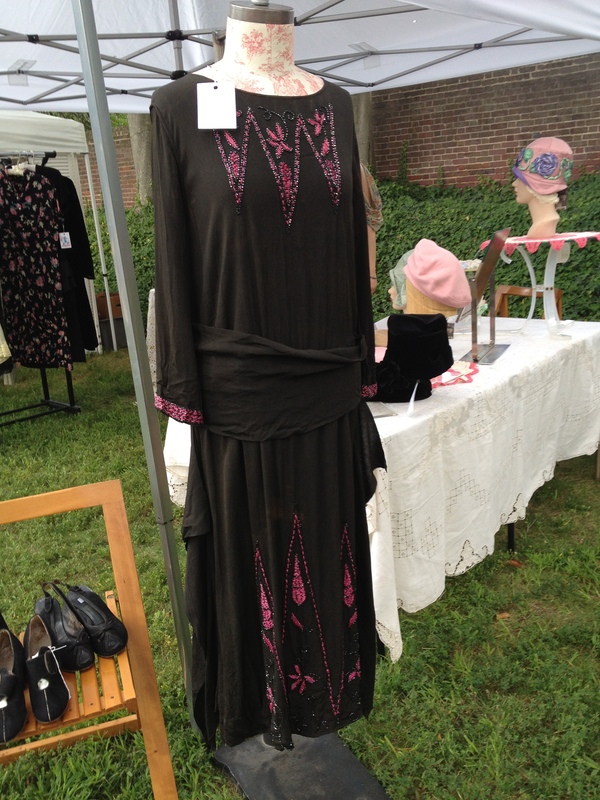 In a similar fashion, what if you find a 1920’s cotton day dress? How ornate is it? If it’s got wonderful embroidery or tailoring details, you might want to spend that much on a day dress that you could wear more often. Fabulous-ness and wear-ability equate value. 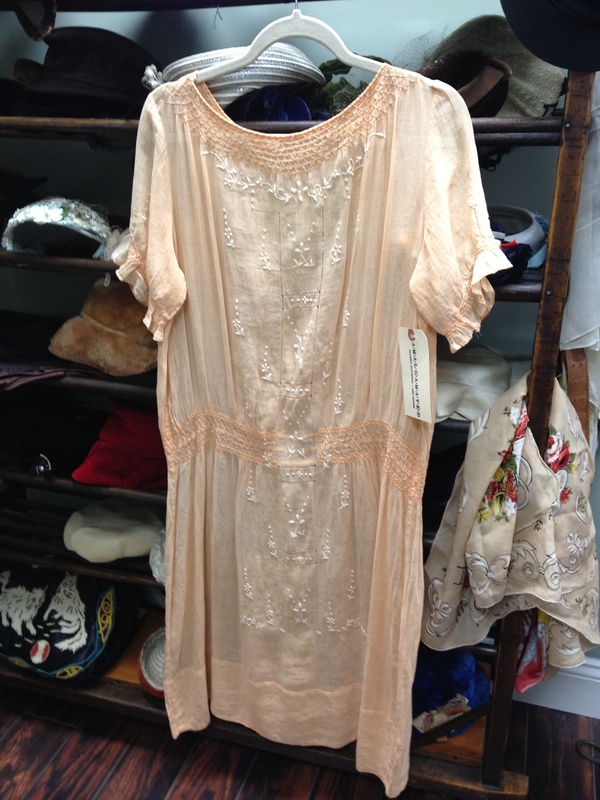 That said, you don’t have to spend $200 on a 1920’s dress. 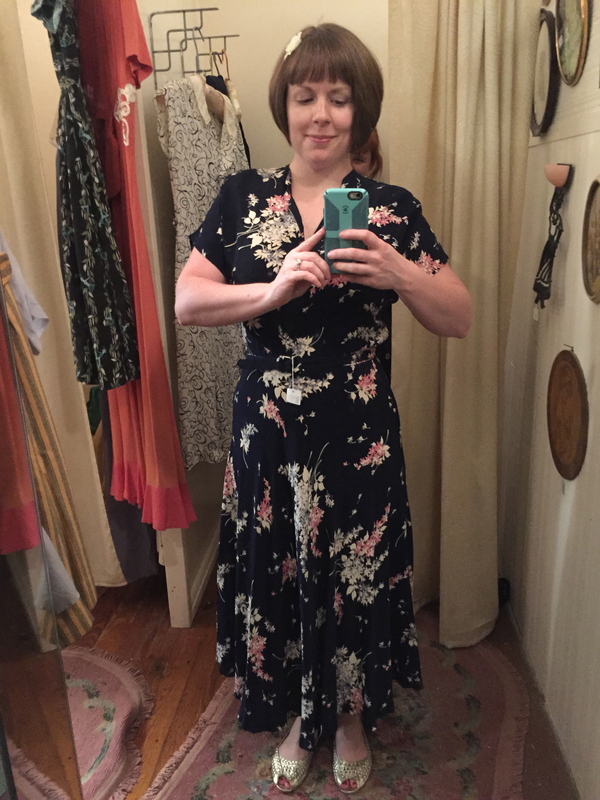 I have found wonderful 1920’s dresses for $80 (at Sweet Lorain in Cleveland, slate gray and cream day dress with about 50 tiny covered buttons up the front, perfect fit), for $40 (eBay, pink day dress with hand embroidered roses, my tailor had to enlarge the arm holes), and for $30 (1920’s maid uniform, black with white lace collar and cuffs, mint condition, possibly never worn). 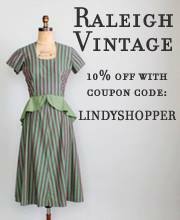 $200 is my benchmark, I won’t pay more than that for anything vintage and I try to implement that policy here when I write about clothing on Lindy Shopper. It has to be the most fabulous thing I’ve ever seen to get me up to that number and it has to be close to the most fabulous thing I’ve ever seen to get me over $100, or I have to really, really need it for an occasion. Beyond that, it becomes unaffordable and I’ll file it with the Miu Miu and Prada dresses I want, but will never own. The more you shop for vintage, the more you are aware of what is rare from each era and what constitutes a reasonable price. 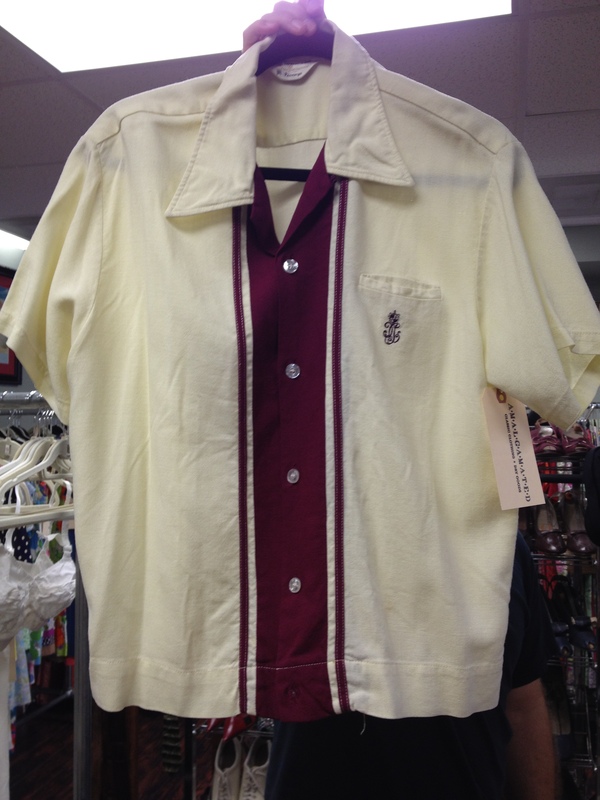 I have been sorely spoiled here in Durham with Dolly’s Vintage, which hasn’t priced anything I’ve picked up in the store over $35, but then Dolly’s doesn’t have a lot of swing era items. You may pay anywhere from $30 to $80 for a vintage 1940’s or 1950’s day dress – would you pay that much for a dress at, say…Banana Republic? Probably, maybe even more. 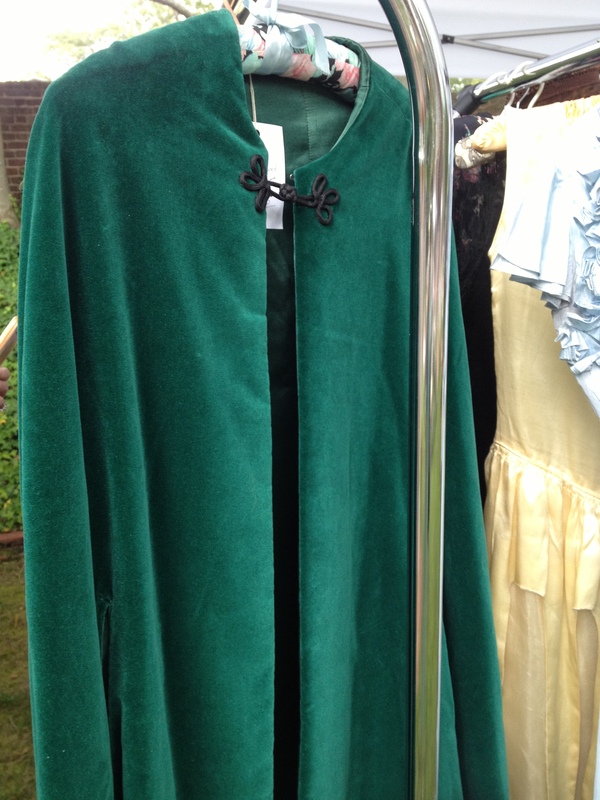 And if it fits you better than a BR dress and it’s one of a kind, it would be worth it, right? eBay can be tricky, since you are bidding against other people. 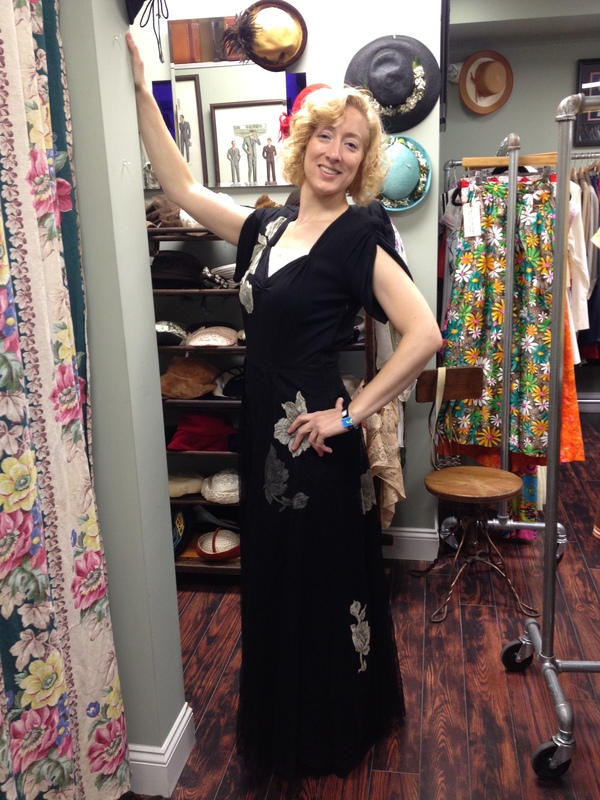 I find that placing my maximum bid and just walking away until the auction is over is the best policy for me, which is how I acquired those two 1920’s dresses at such a low price. I can’t rely on eBay to absolutely get me what I want unless I’m willing to wage a bidding war, but you really have to choose your battles on eBay and only wage war for those items that you absolutely must have. You’ll feel it in your gut when that item shows up. There are no guarantees you will win and losing something you’d like to own can hurt, but the odds of getting something amazing are much greater overall because there is a larger selection of items. 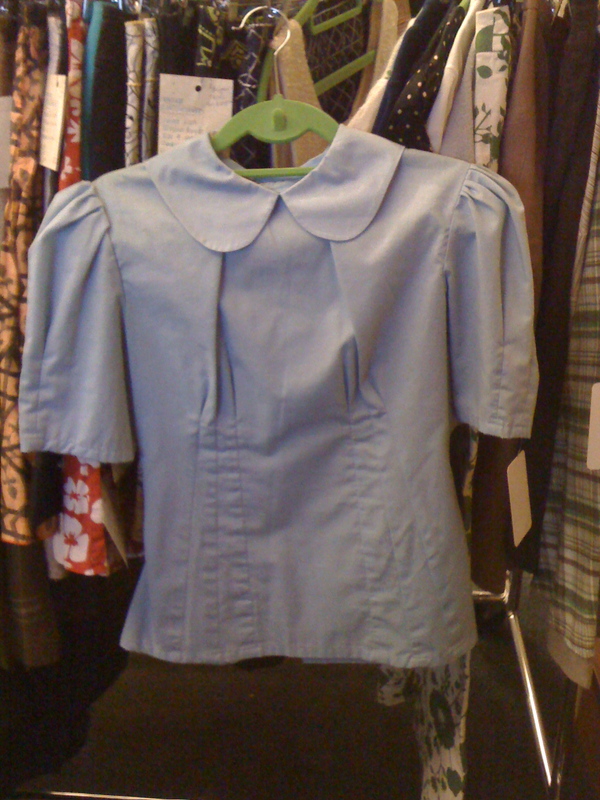 There are also those eBay sellers who have severely overpriced their items (Buy it Now $198.00 for a cotton 1930’s day dress that is fairly unremarkable) and they keep showing up in my searches week after week after week (*cough* VioletvilleVintage *cough*), but there’s a reason the items continue to be re-listed – no one is willing to pay that much for that particular item. If no one is willing to pay that much, then why don’t they lower the price so they can sell it? I have no idea. I’ve been tempted to write to these sellers and let them know what price I would be willing to pay for their wares, but it’s not worth my time because there are so many other dresses out there. I’d love to hear your experiences with prices, both eBay and retail, and I’d be happy to take any follow-up questions you may have. It was hard to organize my thoughts on this topic because there are so many factors that go into my decision to purchase a particular item of vintage clothing, but price is definitely a big factor.